Being on a salad spree is no fun really. 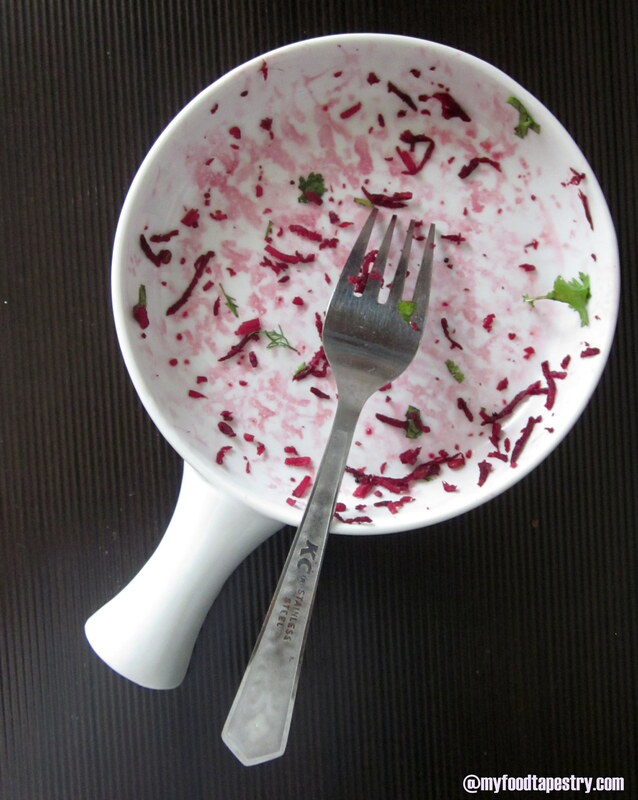 Chomping on plain old carrots, chewing romaine and mindlessly mincing the veggie can be exciting for first few nights, but it sure gets exhausting when you intend to continue the salad sojourn for days to come. I know of this, coz it happened to me. But I want to diligently stick to the fad, so I fish for new ingredients, newer proteins and yet newer ways to eat my greens. He was heading out. Not one to carry a tiffin, grabbing a sandwich or some street side junk are his usual options. Well, that was not be that day. I was determined to pack his supper. Toasted almonds – for that extra bite! To add a protein to your vegetable bowl is a must. That extra mile on the treadmill is of no use if you don’t support it with a repairing agent. Lean muscles, shiny hair and strong nails give obeisance to exactly this necklace of amino acid. Yea, so all in all, it’s that important. So I add channa one day, paneer another, Mung sprouts, soya nuggets, boiled peanuts, kidney beans, garbanzo beans, tofu and assorted nuts to give you an idea. 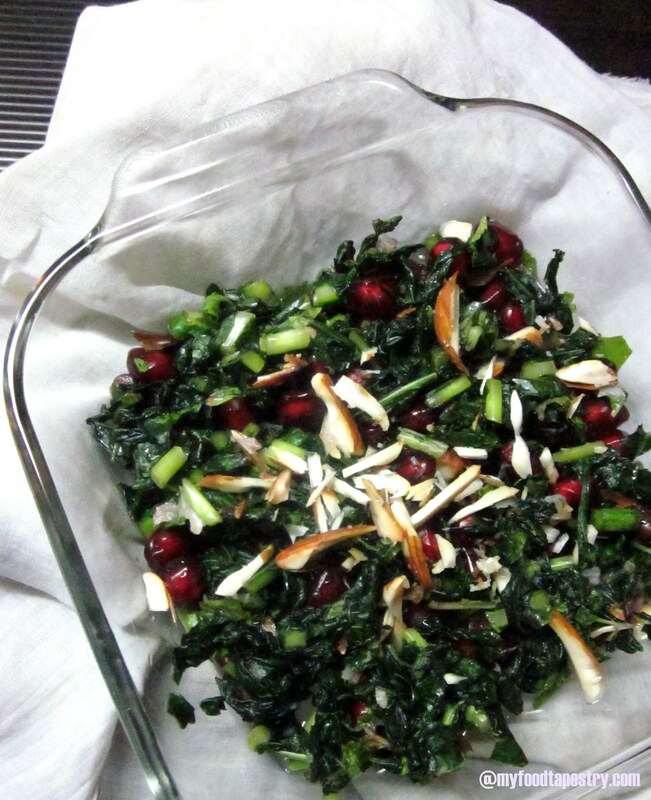 Kale channe or black bengal grams is what I used for this wonder salad. Its nutty. Its wholesome. It adds enough bite to fill your bowl as well as your tummy. 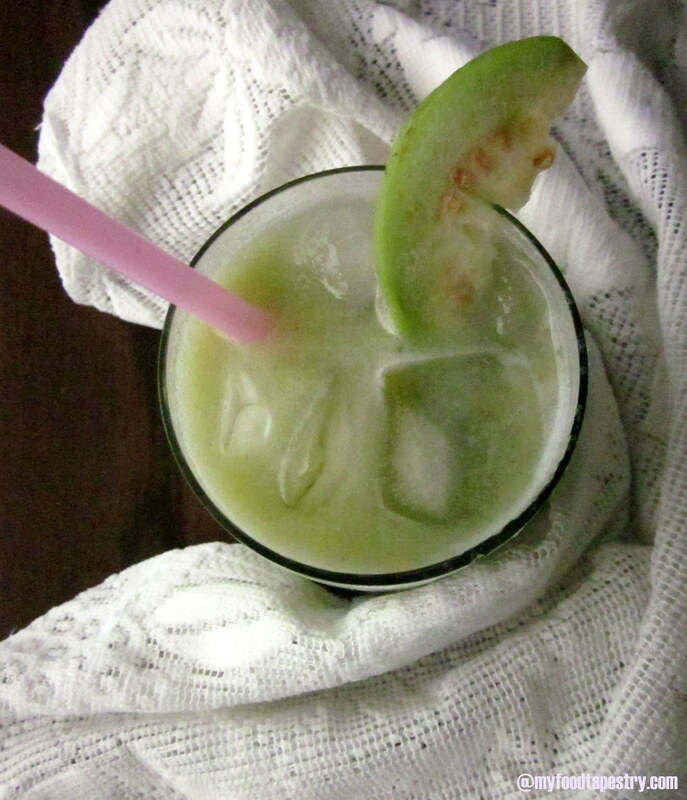 Lime – can’t do without it! 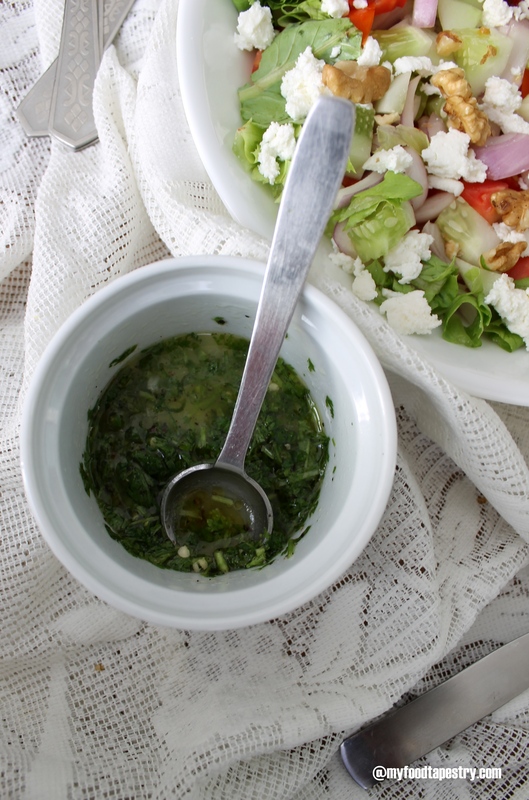 Making the vinaigrette is therapeutic – for me. I love whisking lime juice and extra virgin olive oil. Pounding pepper, sprinkling rock salt, crushing garlic – oh yea! Me loves it. I try to stay away from creamy sugary dressings as it annihilates the entire purpose of me chomping on greens. For the dressing – juice of 1 lime, 1 tsp extra virgin olive oil, 1 clove of crushed garlic, 1/2 tsp pepper powder and salt to taste. Boil the black bengal grams in a big pot of boiling mildly salted water till they are almost done. Drain and keep aside. 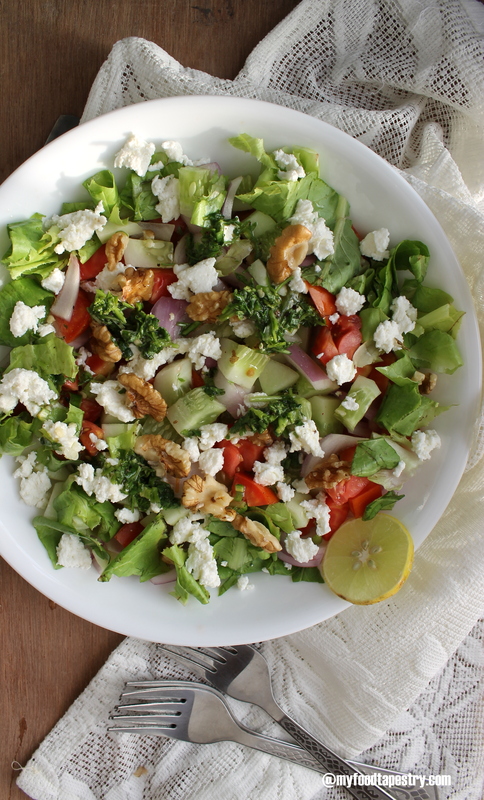 For the dressing – whisk together all of the mentioned stuff. 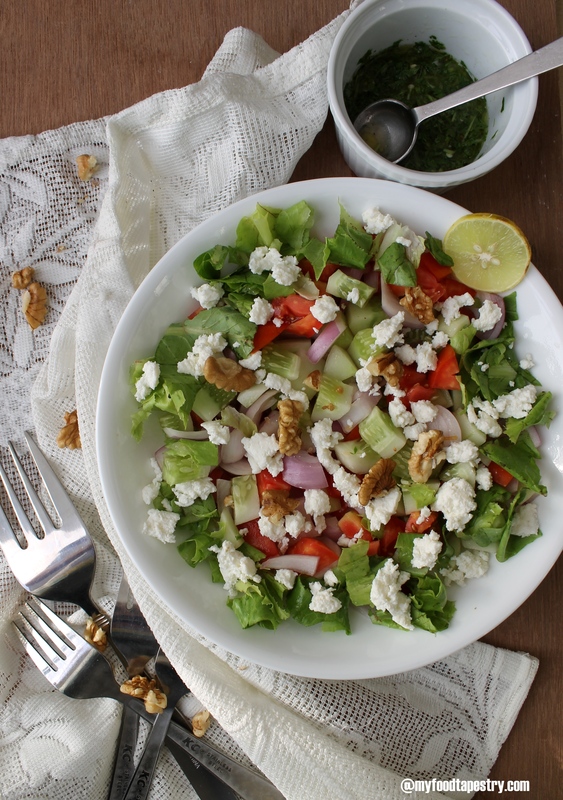 Toss all the salad ingredients except the almonds. Mix in the dressing. Toss well. Refrigerate if required for 30 minutes. 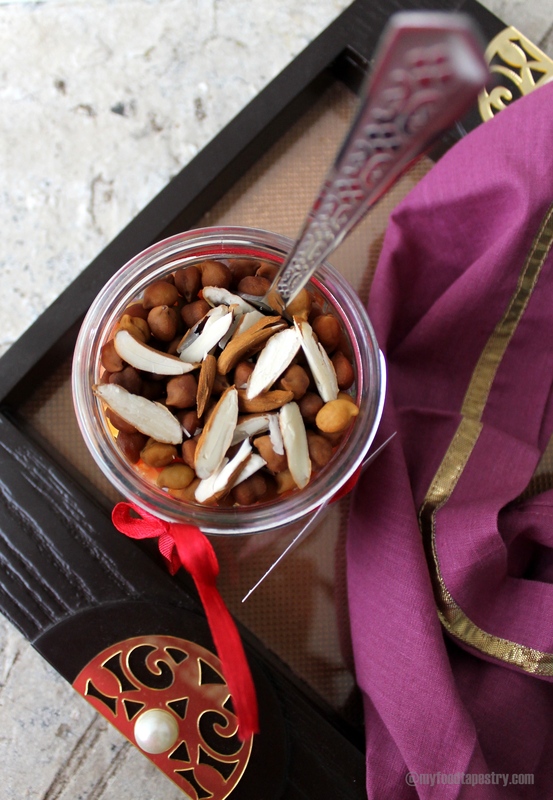 While serving garnish with toasted almonds. I love the crunch from the nuts so I add loads! 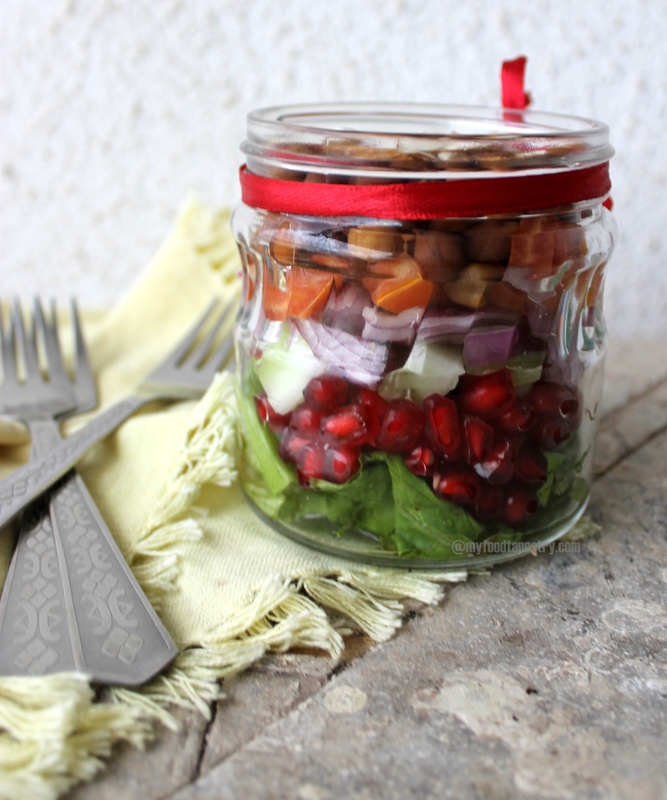 If setting into jars – pour the vinaigrette first. 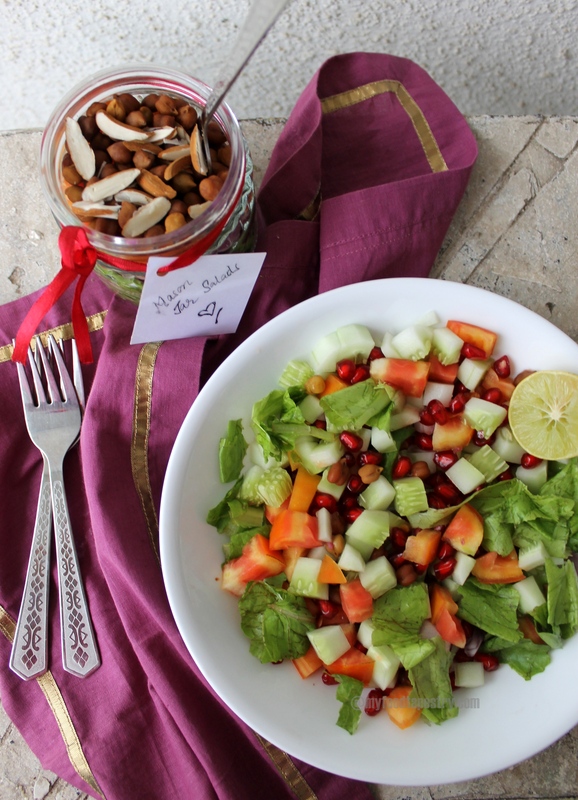 Then layer with boiled bengalgram, cucumber, pomegranate, tomato, onions, lettuce and lastly toasted almonds. Angie’s Fiesta Fridays is something that I look forward to every Friday. She holds this virtual potluck party for all of us. Its one post where you get sweet savoury, mains, appetizers n gorgeous desserts all under one roof and not to mention a whole lot of wonderful enthusiastic bloggers too! So I’m taking a salad this time. What are you? 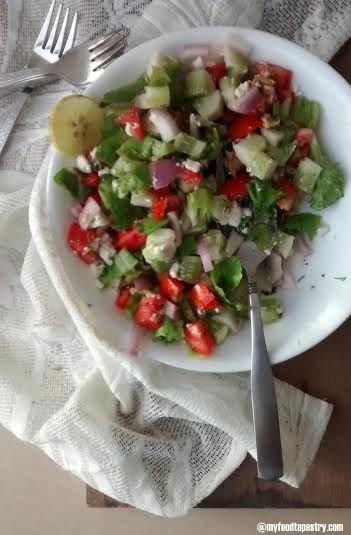 Sometime back, dishing up a salad was just tossing cucumbers and tomatoes generously sprinkled with lime and chaat masala. Not anymore. Not when I strive to eat huge big bowls of raw eats and wrack my brain to include assorted new vegetables and some form of protein. Most of the times I am successful and there have been times when I have been horribly let down. But lets not talk about the dampeners. 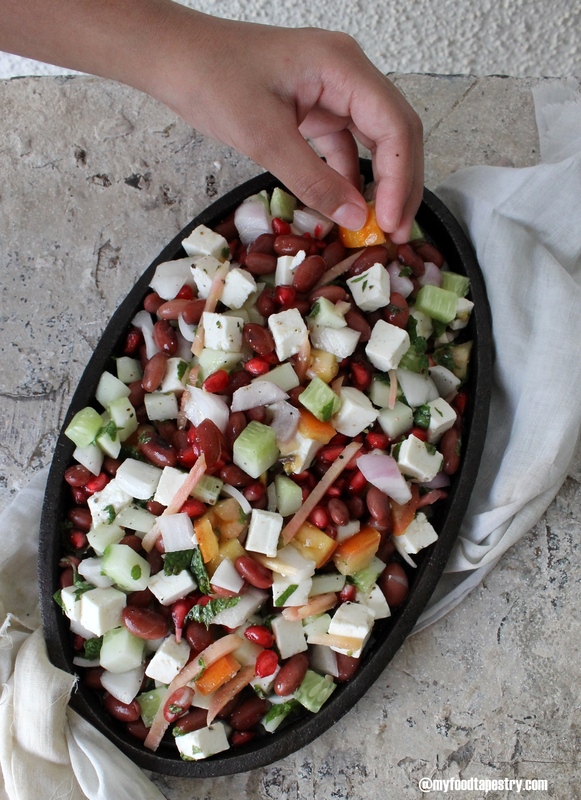 I am here to give you a wonderful protein rich salad recipe that I concocted on a whim! I used red kidney beans. Soaked them well for over 5/6 hours, and boiled in a pot full of salted water, they added body to the salad bowl. 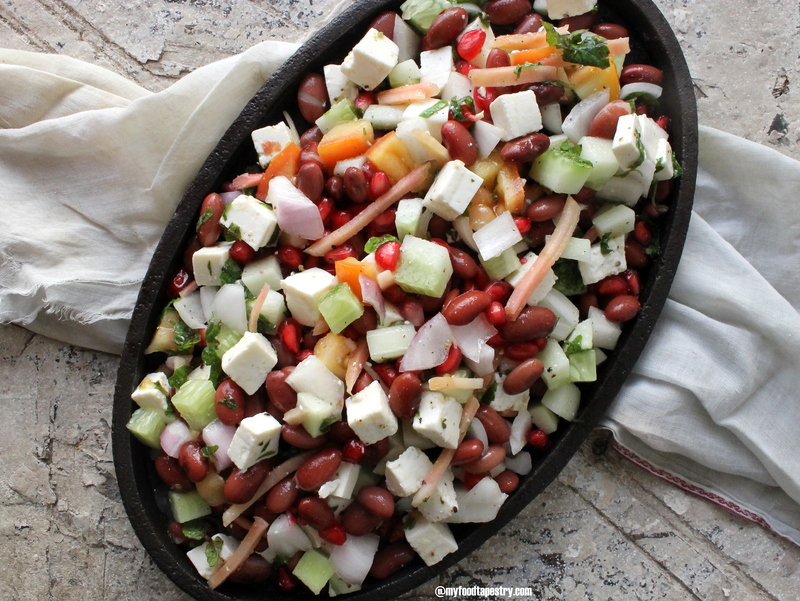 The nutty soft texture from the beans laced with crunchy raw veggies makes for a succulent combination. 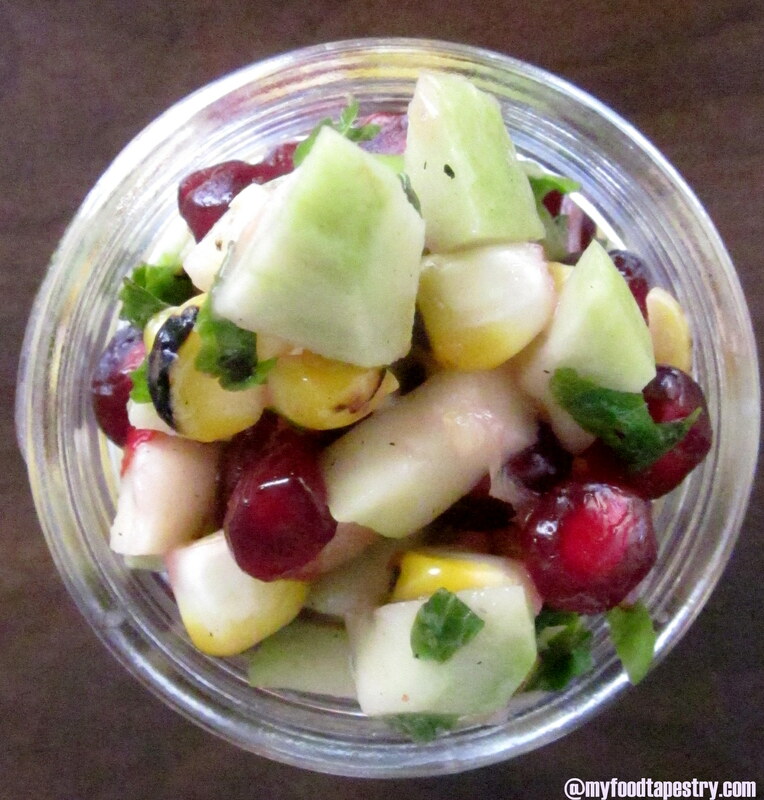 A handful of these red pearly shiny fruit elevates the acidic salty salad to another level. Always add a citrus fruit. Some fruit, any fruit – orange segments, berries, kiwis, apples, cherries etc. The list is huge. 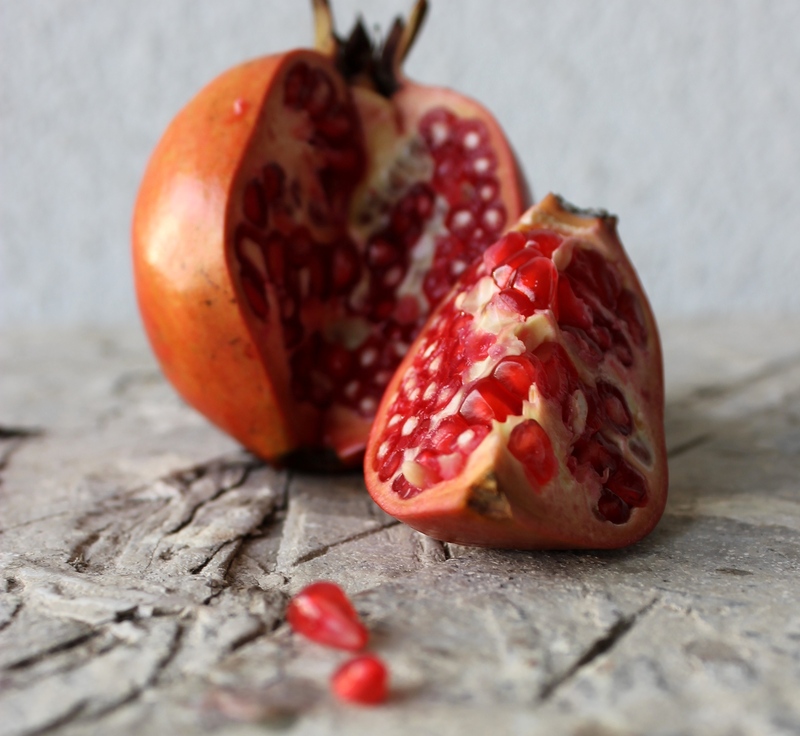 But for now, pomegranates it is. 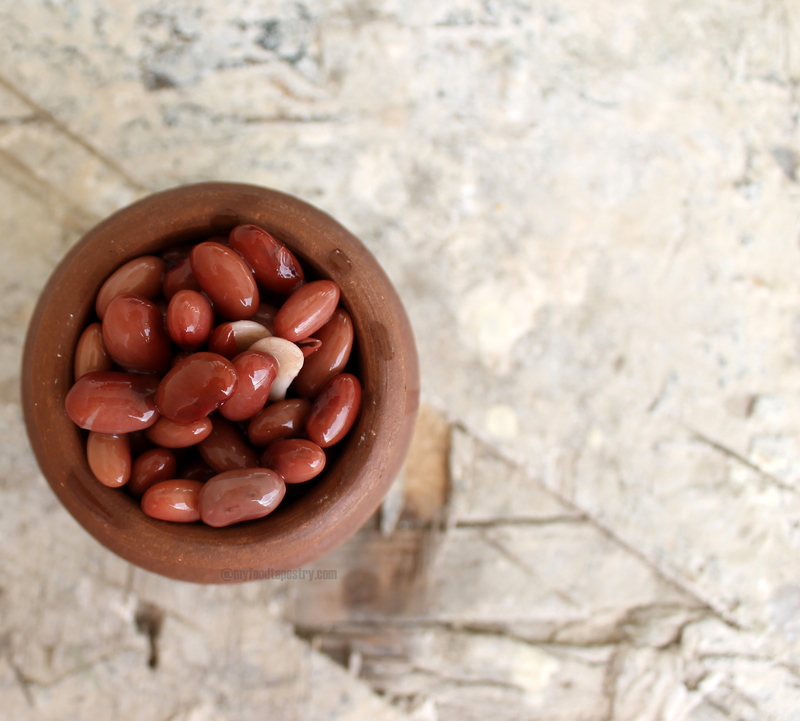 Beans are slow to digest and if not boiled or chewed well, they can cause a lot of heartburn, acidity and stomach ache. 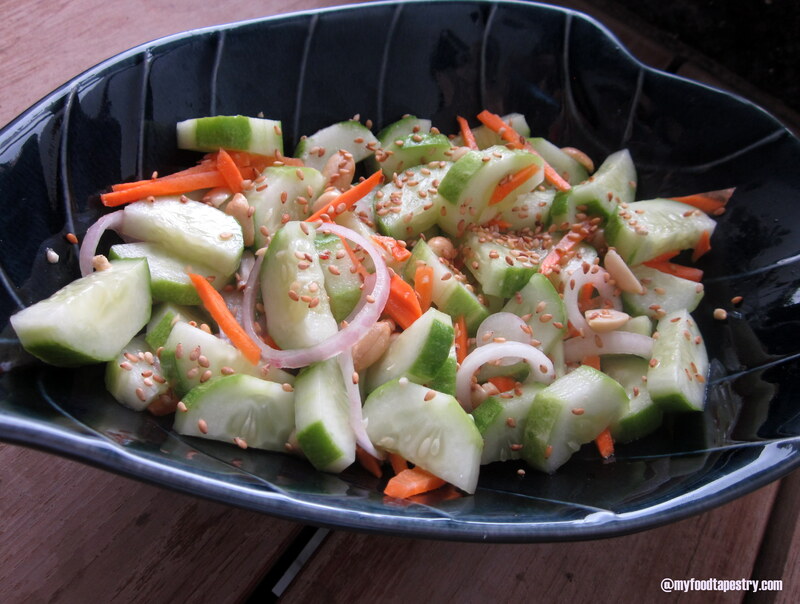 So I added julienne ginger pickled in salt and lime juice as a bit of garnishing. Ginger aids in digestion and helps in absorption and assimilation of essential nutrients. 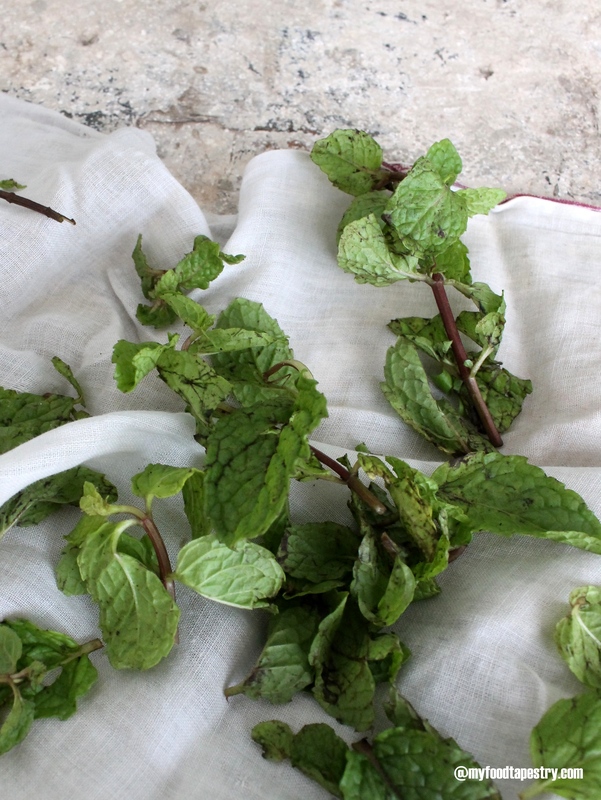 Ginger is highly pungent so a little bit is enough for your salad bowl. Feel free to skip it if you can’t tolerate the sharpness. 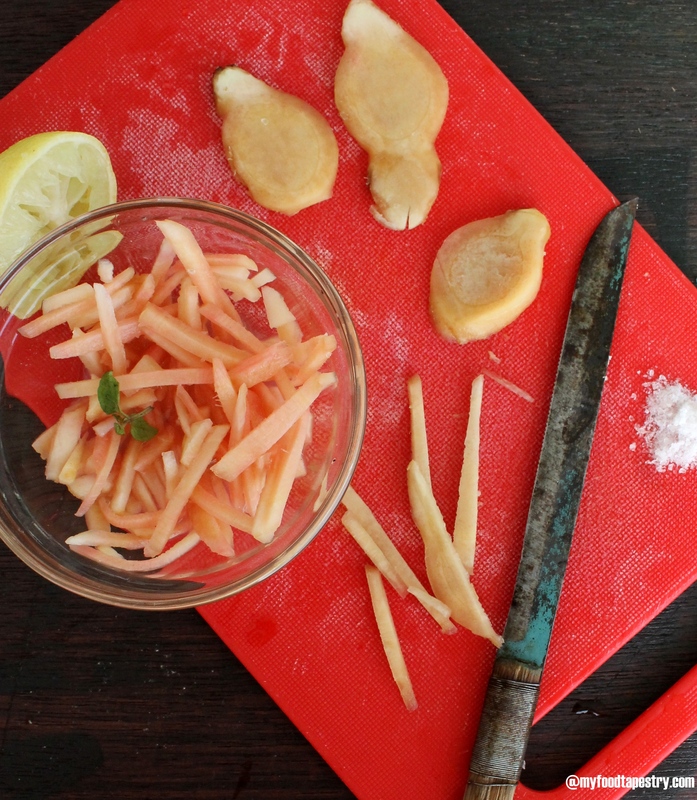 2 tsp ginger julienne – soaked in little lime and salt for 30 minutes. 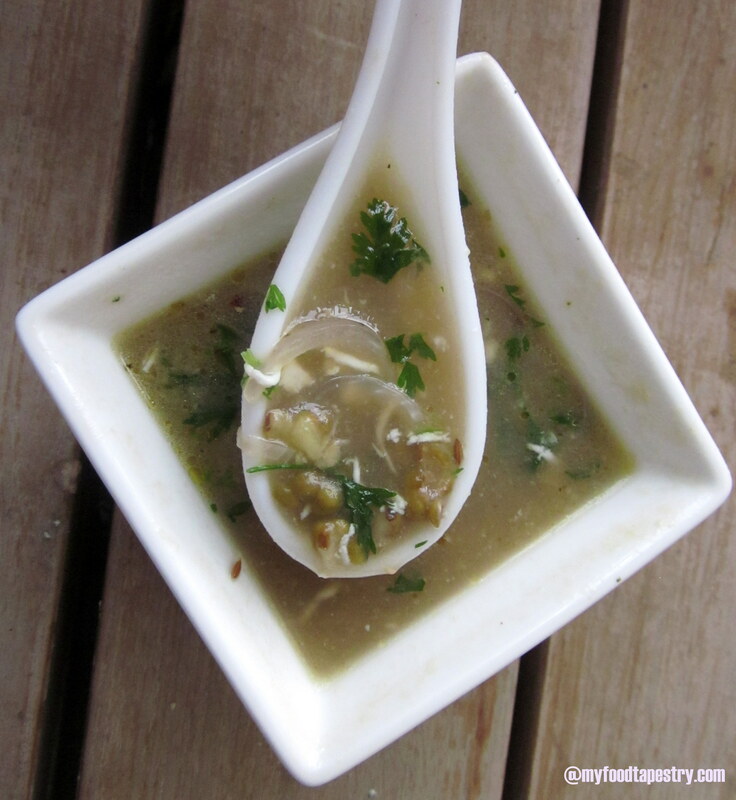 For the vinaigrette – mix 1 tsp extra virgin olive oil, juice of 1 lime, 1 tsp honey, salt and pepper to taste. Optional: 1 tsp more oil to sauté the cheese if you do not like it as is. Saute the paneer/cottage cheese if required. Mix all said ingredients except the vinaigrette. chill for 30 minutes. Pour the limey dressing over it. Toss. Chill for another 10 minutes. I like the paneer as it is, but I know many who don’t. 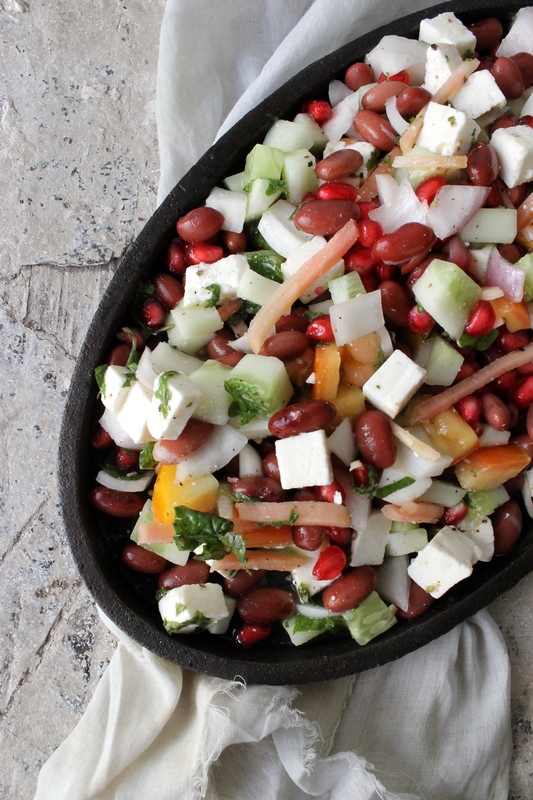 A bit of sautéing or grilling does the trick to include it in your salads. 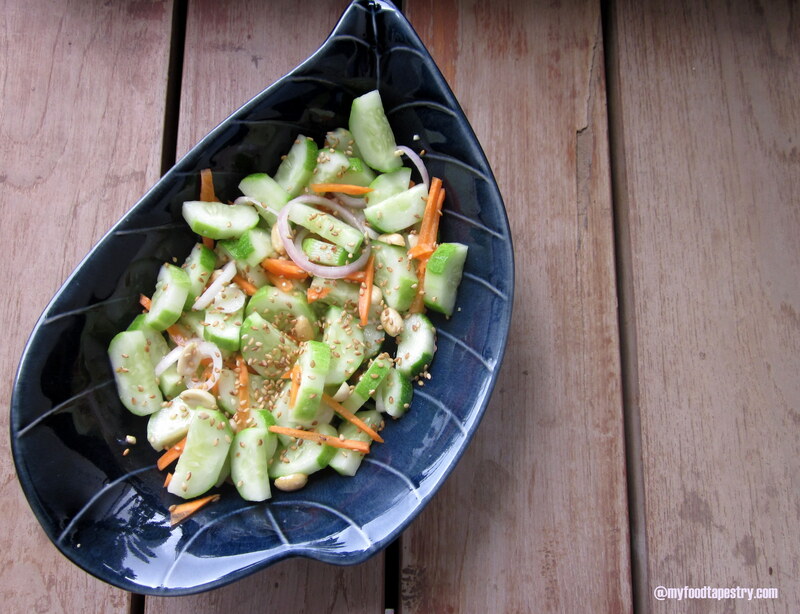 When I sit with my bowl of raw veggies, I fish for my favourites and relish the juices from the marinated fruits and vegetables. Flavors like these make me go back every single night to these huge enticing bowls. So yumm! I am taking this to Angie Weekly Potluck party – Friday Fiesta #30! While the world trips on quinoa and chia and gluten free and muesli and sunflower seeds and what not, I stare at my pantry and realise I am yet to go there and do that. So, whats stopping me? The availability? Naah.. big huge supermarkets in one of the biggest cosmopolitan city of India, can’t make that excuse! Recipes? I am a food blogger!! I have blogger friends dishing out super food made with super ingredients and fantastic recipes.. for God’s sake, I can’t run with that either! Sigh.. so what is it. Friends, I am just lazy. Terribly lazy and the fact that I think I get enough nutrition from what we eat on a regular basis is a huge hindrance to my foray into this new health food world. I plan to change all that. Buying a small pack is all that it’ll take to throw me into the bandwagon and then I know I will be hooked for a long time to come. 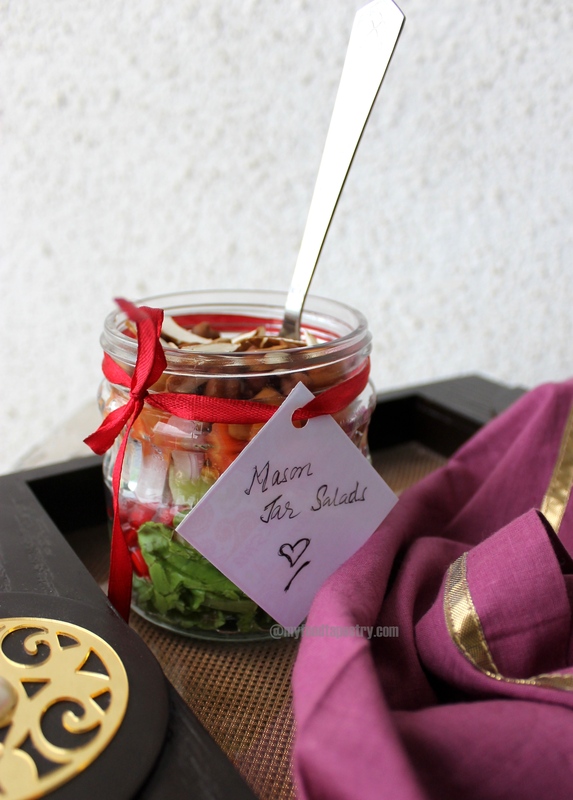 The vinaigrette was spiced and flavoured with minced green chilies and coriander leaves. 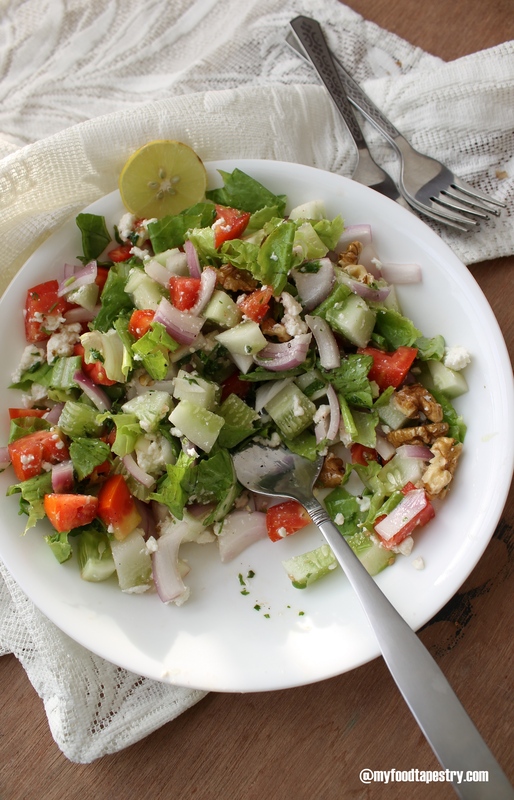 Feta was replaced by regular paneer or cottage cheese. Broken bits of walnut added the much required crunch and yes.. that’s pretty much it. 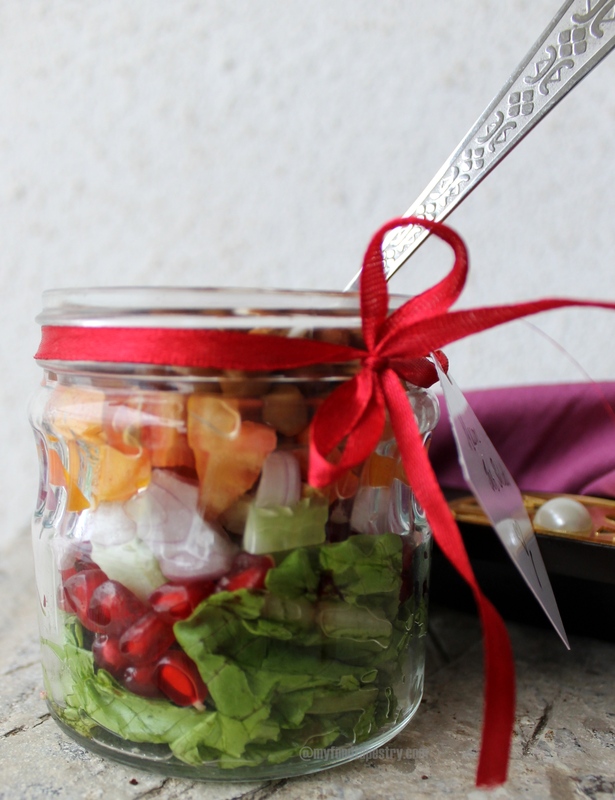 To make the dressing – mix all the ingredients of the vinaigrette and whisk thoroughly. Keep aside. 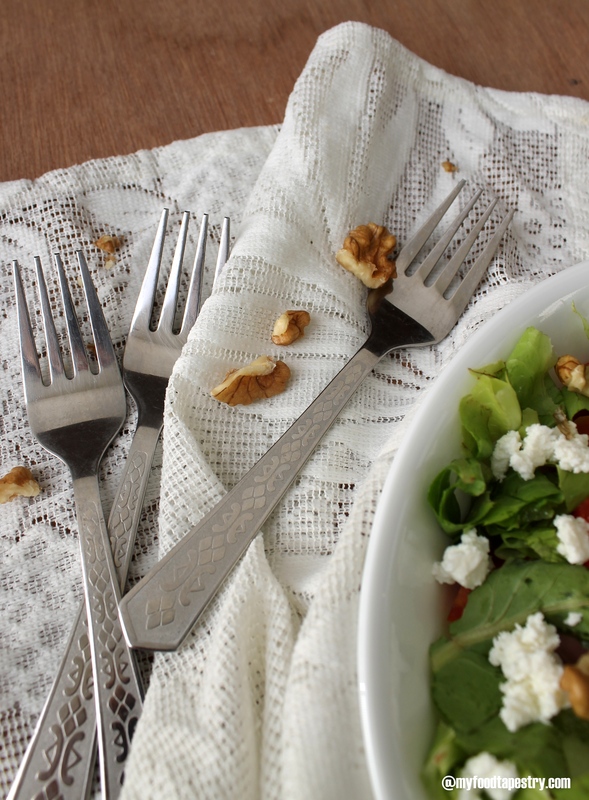 In a big salad bowl, take all your vegetables, except the nuts. Mix. Pour the dressing over it. Gently mix. Refrigerator for at least 30 minutes. When ready to serve, top with toasted nuts. Note: You can skip/avoid any ingredient you don’t like. I did that to olives. Yeh.. not a big olive fan! Note: Feta is creamier and softer, but our very Indian Malai paneer proves to be a good match to it. Try it. The very lovely Angie has been hosting a virtual potluck bloggers party and in spite of being invited long back, I am attending the festivities now! This post is being linked to Angie’s Fiesta Friday #23. Very recently I signed up for an instagram account: namrata_mft. If you would like a peek into my daily life, add me! Nearing an unfinished book, catching missed episodes at 10 am in the morning, helping friends strike good deals in clothes and gifts, paying important pending social visits to cheer sullen relatives, crafting amidst incessant chatter with my 6 year old, revising tables with her, discovering the romance in watsapp with my traveling husband(the guy was totally enamored by it – 🙂 ) and among all these, failing attempts at writing a post-worthy post. So there dear friends and foodies. I have not been doing much apart from a LOT of lazing and vacationing. And in all honesty, I did try to write. But words fell and failed me. It’s no fun to publish something without a good mean bone to feed on. “Not many people read you know” is one constant refrain I get from the husband. Yes, true. But I still like to write, I retort. And so I do. Without a care of who is reading and who is not, I give words to my feelings and thoughts. Now, this is a personal creative high for me. Sigh! but this so called high evades me most of the times lately, leaving me groping for words and quotes. I just needed a nudge, a push to wake me up from my trance like state. And Priya did the needful. A simple message, if I would be interested to contribute to her diabetic friendly week. Oh Yes! Interested I am!! “But I have a block”, I told myself. I can’t seem write. And Diabetes? I have no clue about that.. Kicking all the buts/ifs/hows/whys, I set to work. first I had to read up about Diabetes. So what better than Priya’s simplified illustrated theory. A must read. Her site is a diabetic’s delight. 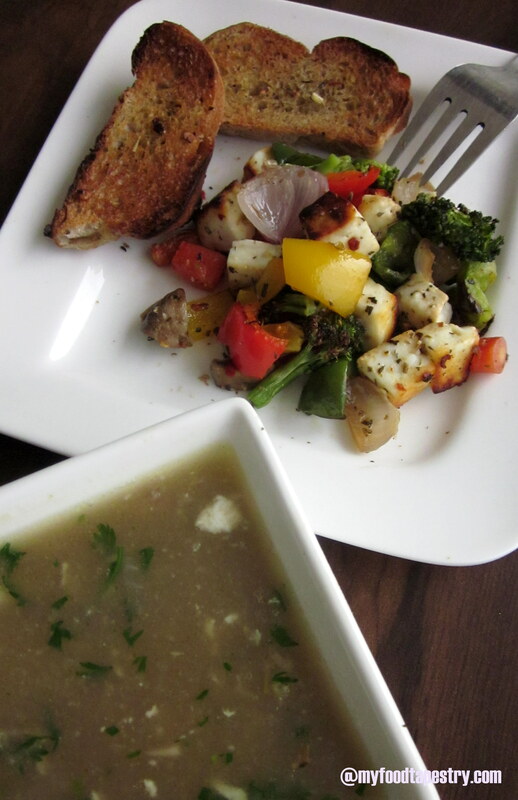 To contribute to her fabulous Diabetic Friendly Food Week, I zeroed in on a soup, some grilled veggies and of course the favorite carb – made in a fat-free way! Green whole mung beans have low glycemic index. Low glycemic foods promote healthy blood sugar levels. tend to have lower total body fat levels as opposed to those who consume high-glycemic foods, such as white bread and soft drinks. In recent studies, mung beans reduce blood glucose, plasma C-peptide, glucagon and blood urea nitrogen levels in non-human type-2 diabetic subjects. See #Reference. Paneer or cottage cheese made from Cow’s milk is low in fat and contains a good amount of protein and calcium. Refrain from using “malai paneer” or the super soft melt in mouth types, as they are alarmingly high in FAT and low in nutrition. Shrewd use of this cheese for diabetics can work brilliantly for their overall health and fitness. 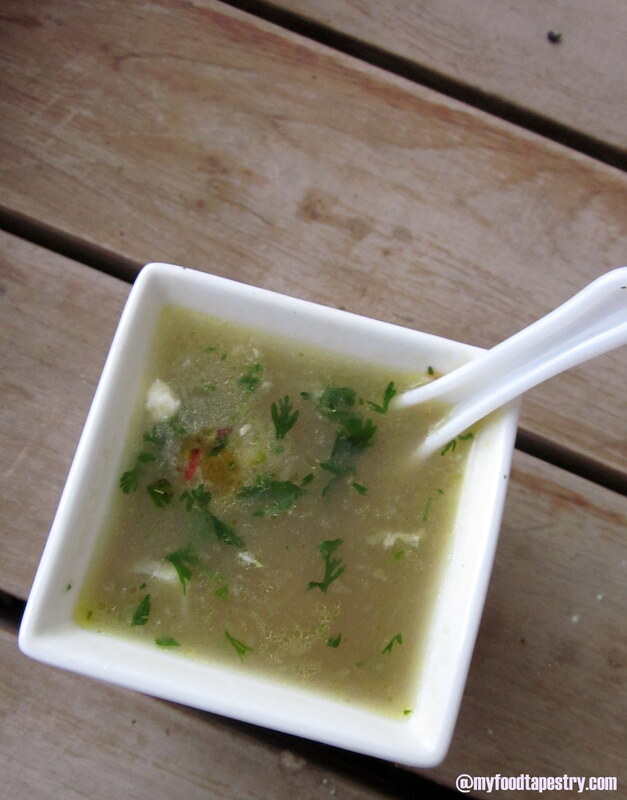 Simple, abundant flavors and so easy to make, you will find yourself making this soup more often than required. 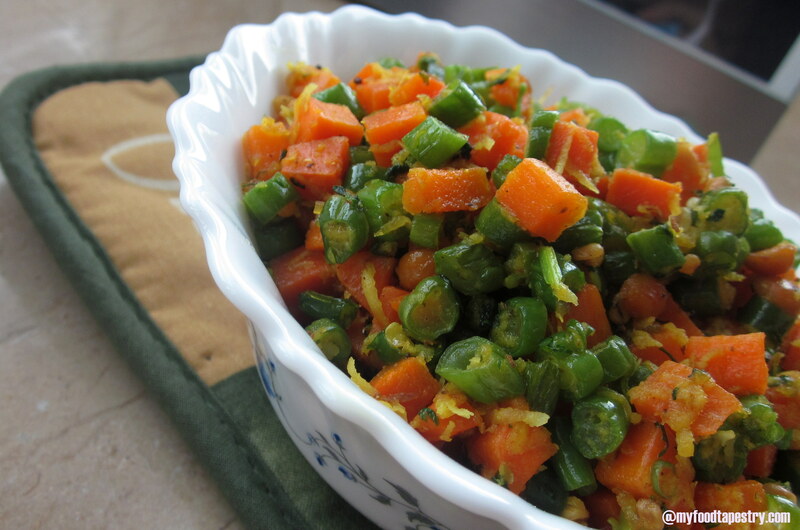 1/4 cup mung beans, preferably soaked for 3-4 hours or overnight. Pressure cook the mung beans in 2 whole cups of water(yes! lots of water for very little mung beans), along with salt, garlic and ginger. If you do not have a pressure cooker and you are cooking them in a pot, then make sure your beans are preferably soaked overnight. The beans should be cooked well, almost mash like consistency. In another pot, heat oil, crackle cumin, fry onions till they turn pink. Then add paneer. Saute for another 2-3 minutes. Slowly, pour the boiled mung beans along with all the water. Stir in pepper powders and check salt. Give it a final boil. 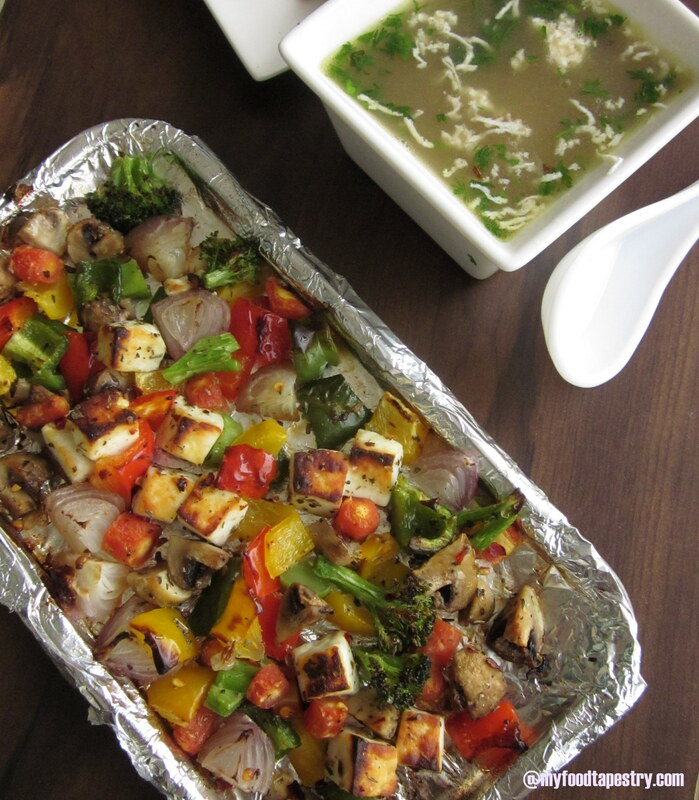 Garnish with chopped coriander leaves and little grated paneer, if using lime juice, stir it in now. 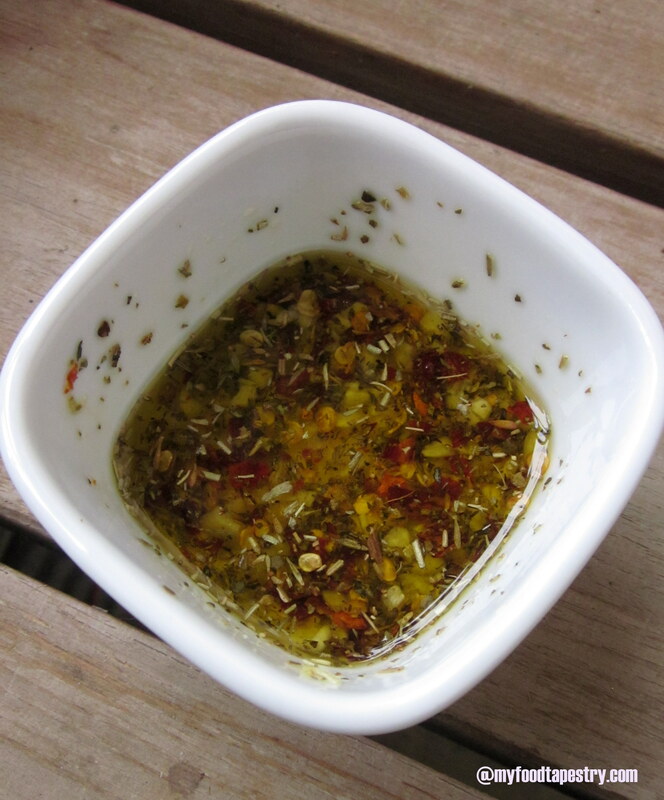 A drop of chili-garlic-herb olive oil enhances the flavor, but if you do not have it ready, don’t sweat. 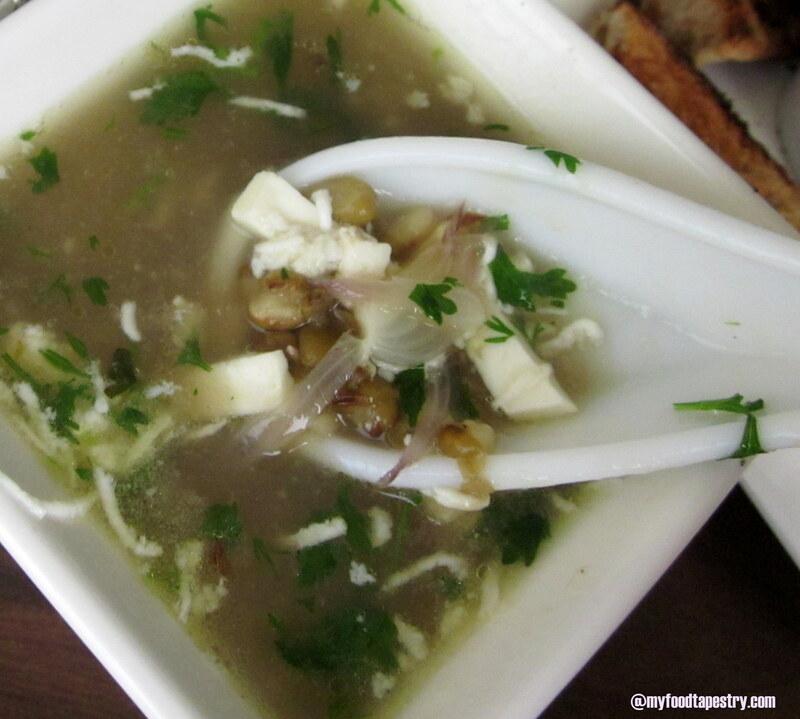 Sluurp this soup away with some grilled veggies and toasted bread. Add 3-4 crushed minced garlic, 1 tsp chili flakes, 1 tsp mixed italian dried herbs, a wee bit of salt to 1 tbsp of olive oil. Mix well. Keep aside for at least 30 minutes before using. Use as required. Use the oil to marinate your vegetables. Or smear it on whole grain bread. This is a no brainer actually. Dice up any vegetable of your choice, I used carrots, broccoli, bell peppers, mushrooms. Paneer is added for some extra bite. 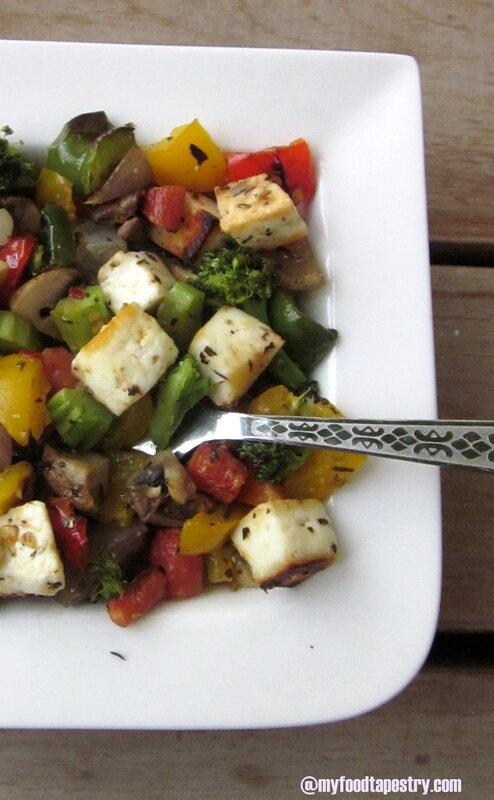 Marinate your veggies in herbed garlic olive oil. Keep aside for atleast 30 minutes. Lay them on baking sheet, bake at 200 C till brown specks appear on the veggies. Alternatively you could stir fry in a thin wok on high till the vegetables are semi cooked and crunchy. Garnish with pepper powder and rock salt if required. 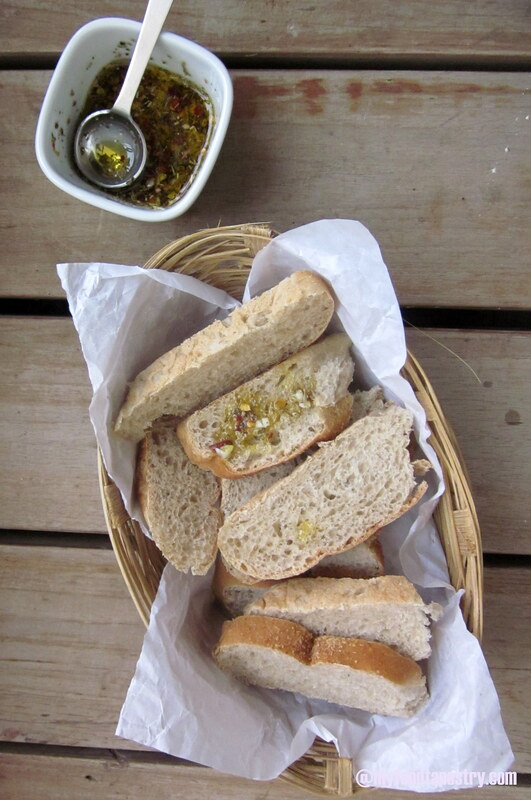 We usually make garlic bread at home, by melting butter, adding all the herbs and minced garlic to it, smearing it on bread, topping with jalapenos and lot of grated cheddar cheese. But we want a fat free version don’t we? Well, for that, use the flavored olive oil and skip the cheese. Toast your bread or roast them on a flat griddle and you have a guilt free and fat free version of the famous Garlic bread. 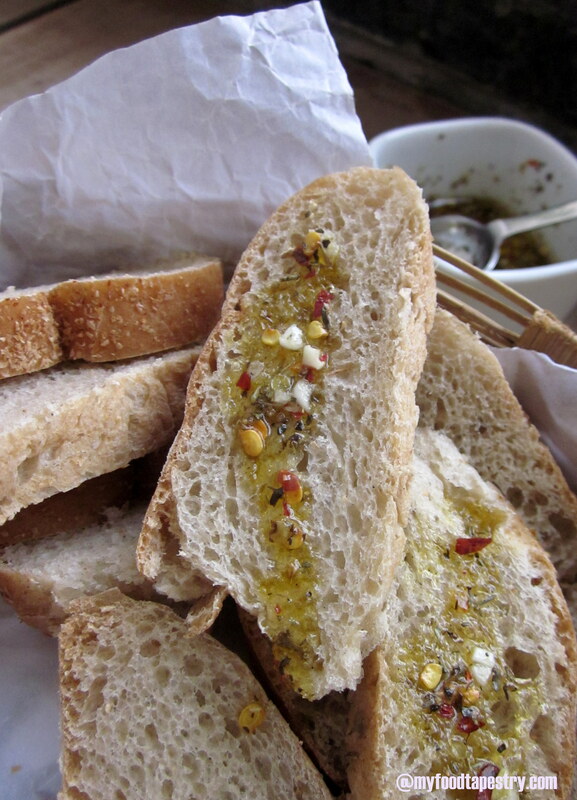 Note: My 6 year old girl didn’t like her garlic bread without cheese, so still using the same herbed olive oil, I grated cheese for her to enjoy. But when you’re watching your weight or struggling with diabetes, I would suggest skip the cheese. 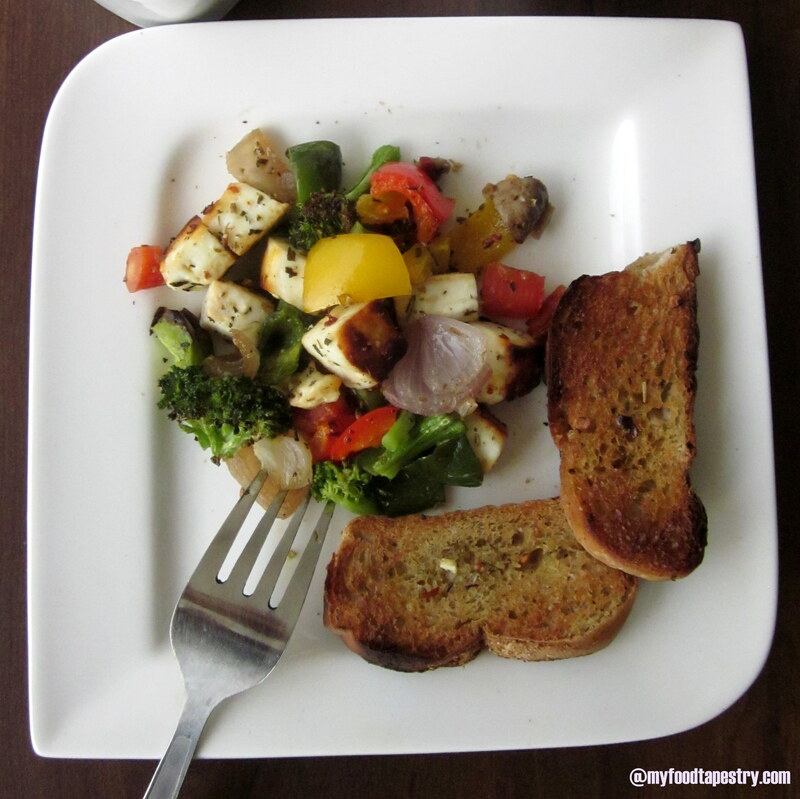 Toast the bread, enjoy with your favorite veggies and a big bowl of Soup! “You got a dozen of guavas?! !”, I asked incredously. “They looked sooo good and buying in bulk is any day cheaper…”, mumbled He. “What bulk… what do I do with so many! How will we finish, and if they turn a little bit ripe.. no one eats… “..my laments were falling on deaf ears, the Bulk buyer was coolly walking off. 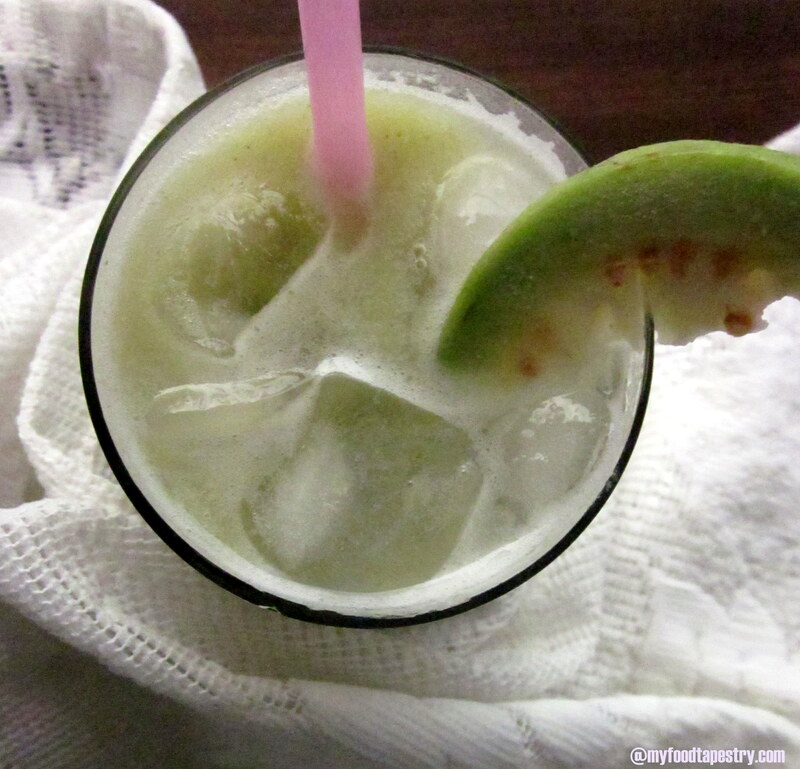 When we were little, guava was never given its due. We just took it for granted. It was there. Just like that. Like, always. Abundantly available. Delicious. Healthy. Cheap. But a few years in a foreign land changed my perspective. Now, I wouldn’t want even one of them going wasted. How ever less we pay, Guava has a priceless tag on it. I stare at them. A bag full of fresh firm green guavas. They look good, I admit to myself. But to finish off twelve of them within a day or two is mind you – is not an easy task! In dilemmas like these, I do what I do best – curiously seek new recipes. A mocktail and a salad were dished up amidst hectic schedules, annual festive cleaning, dance and swimming lessons. Now will you call my search fruitful? You Will! 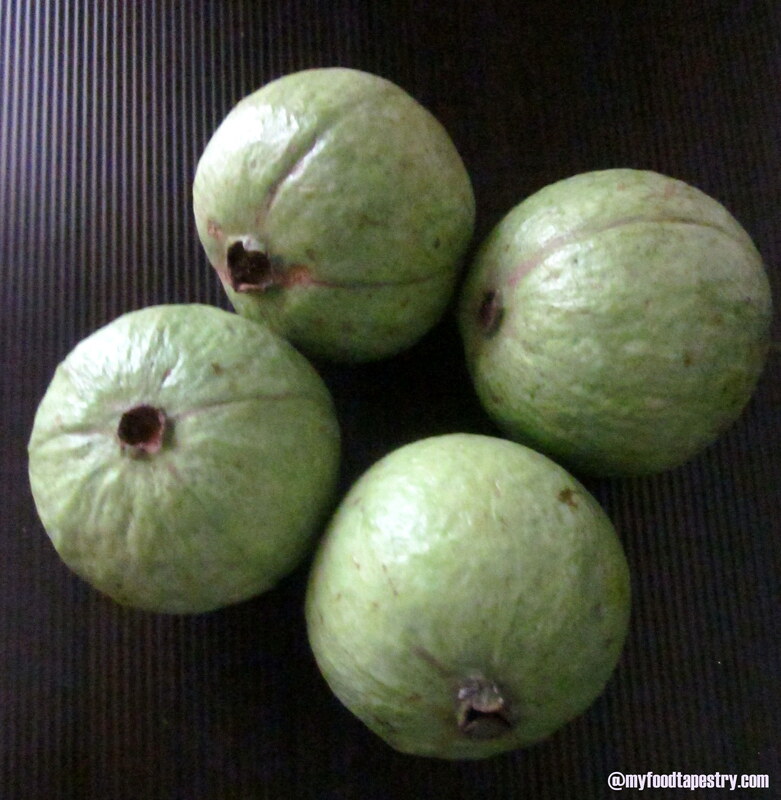 if you can just lay your hands on some fresh guavas that is ;). Ooh! 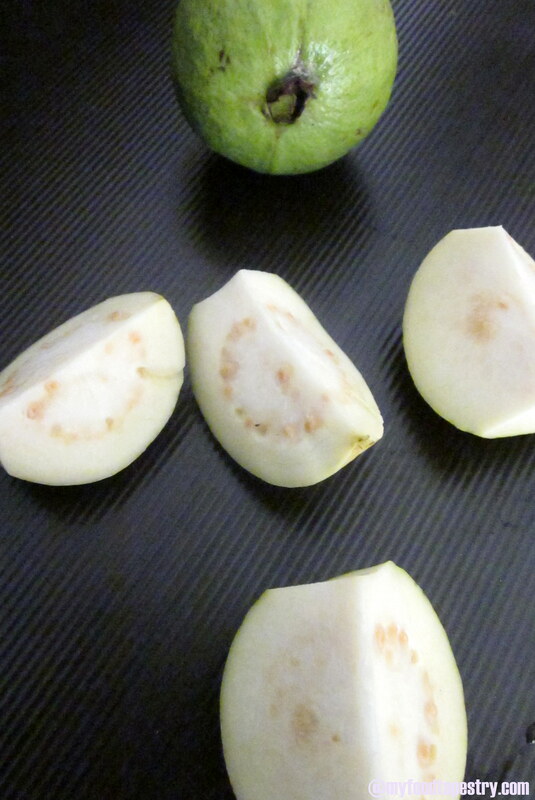 By the way, did you know guavas contain four times more Vitamin C than oranges? I didn’t. And while we’re comparing guavas and oranges, did you know that a guava has 70 times the amount of fiber as an orange? Interesting isn’t it. Guava is also rich in vitamins A, B1, B2, E, calcium, copper, folate, manganese, iron, potassium, and phosphorus. They can help your body deal with high blood pressure, constipation, lung congestion, high cholesterol levels, and more. Cool Eh?! Throw in all the ingredients in a blender along with a cup of water. Blend well till there are no coarse pieces left. Add more water if necessary. Once done, sieve to remove the guava seeds. Taste, season with more lime juice or salt if necessary. Serve with lots of ice. In a bowl, mix all the ingredients of the dressing. Whisk well. 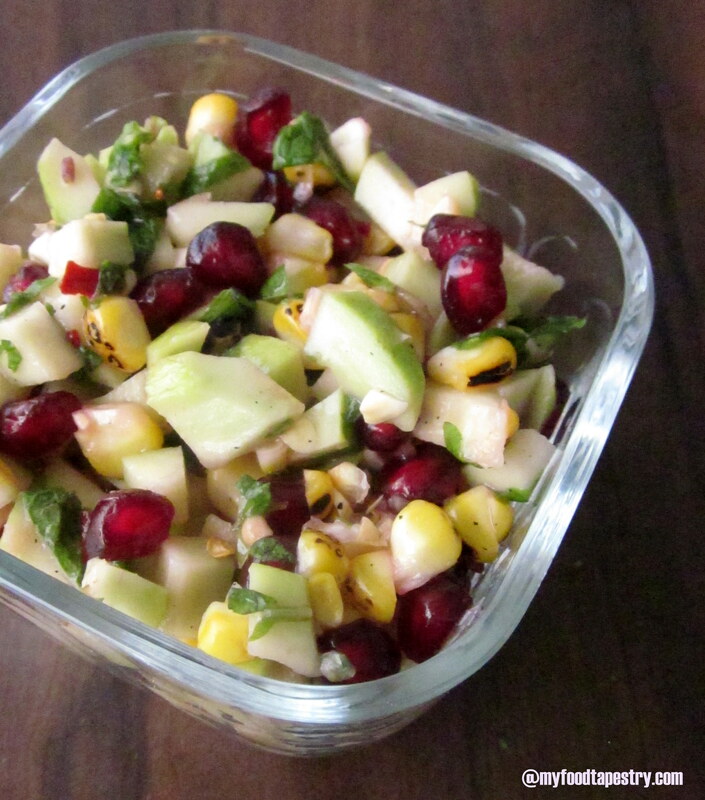 To the dressing, add guavas, corn kernels and pomegranate seeds along with mint leaves. Mix well. The one which your mom and grandmom goaded you to eat. The one which your doctor prescribed you when your iron dropped low. 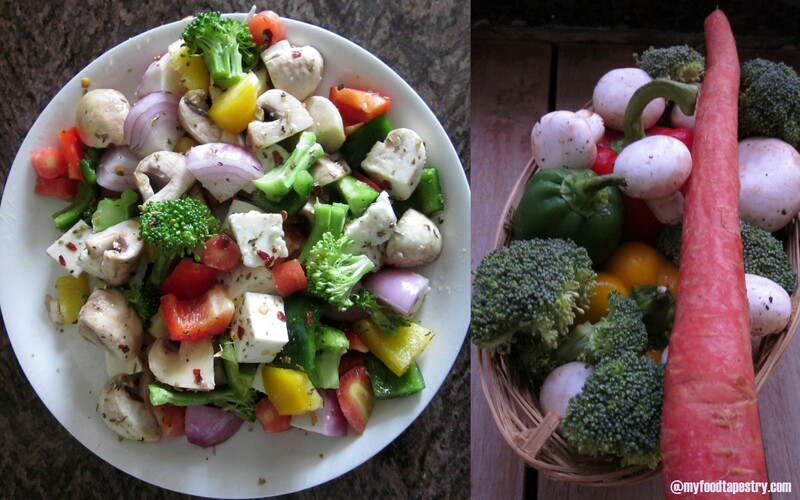 The one which health articles glorify n coax to adopt in your diet plan. The one where your friends misled spinning tall tales of cheeks turning red if you eat the root. 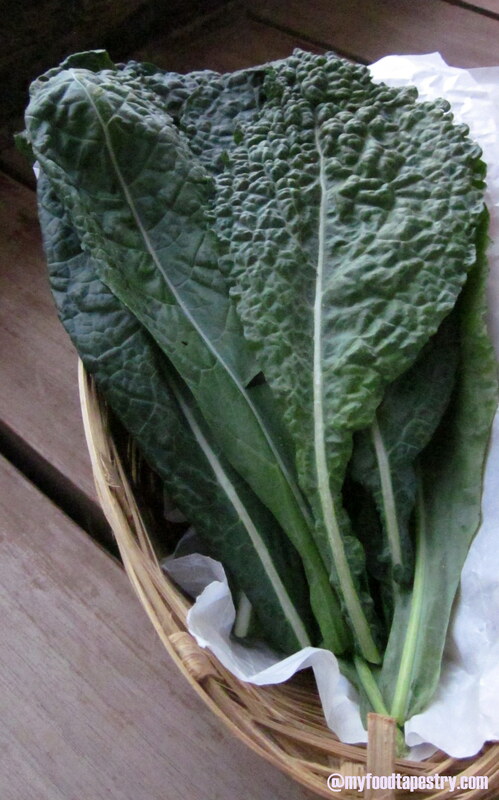 A vegetable that is an antidote for anemia, fatigue, stamina and cancer is naturally a must include in your daily diet. That. 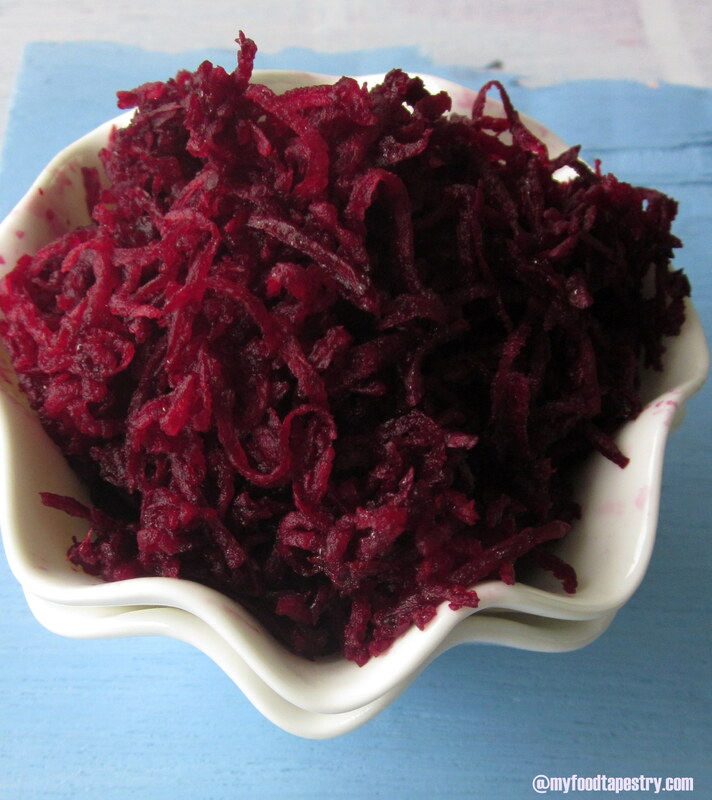 That plain old humble Beetroot is what we are talking about. 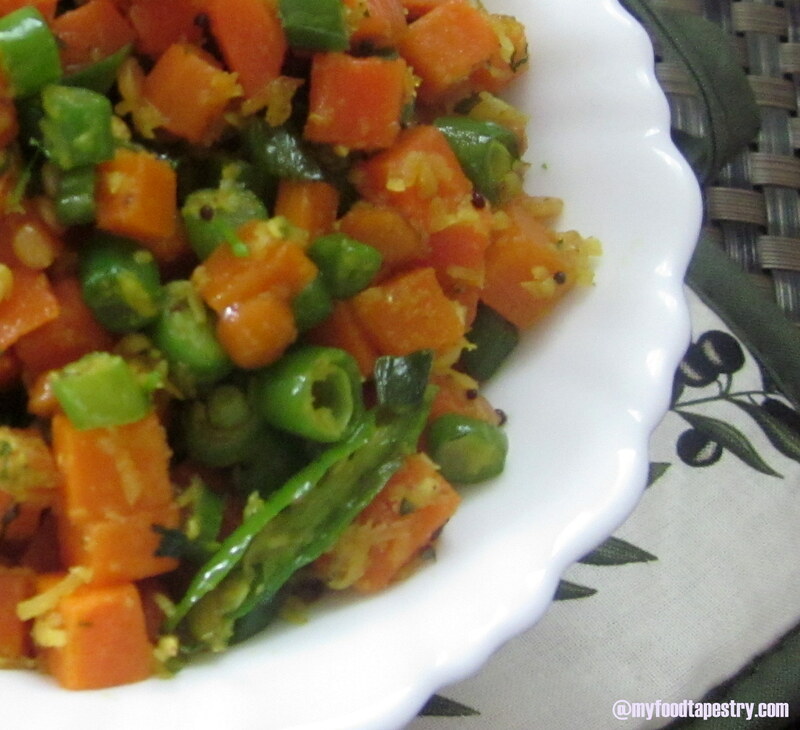 My love for South Indian Stir fries must be familiar to you(no? well.. you know it now 🙂 ). Simply sauteed veggies in minimal oil, seasoned with curry leaves, lentils and garnished with loads of coriander and coconut – I DIGGG! 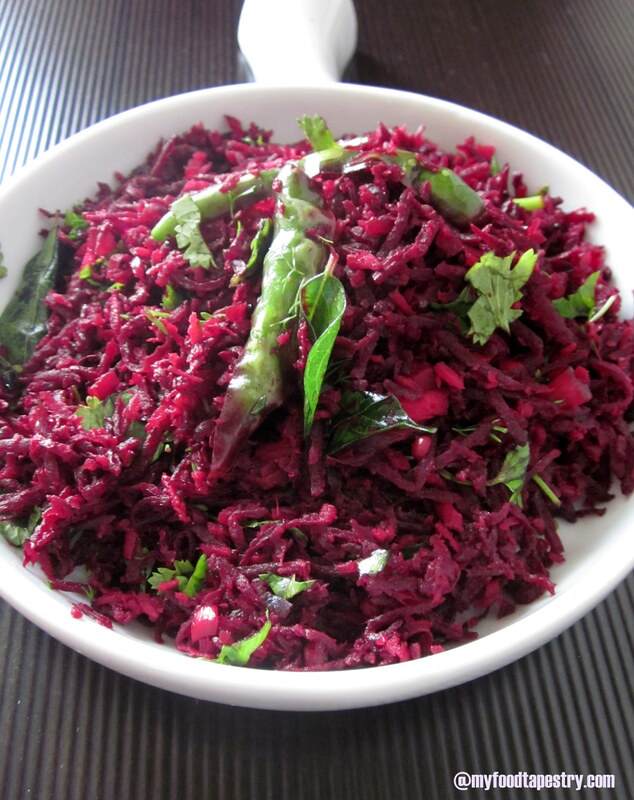 If you are not a fan of Beet’s earthy taste, you will be surprised how just 1-2 cloves of garlic and some curry leaves can camouflage the rawness and infuse amazing flavors to the dish. 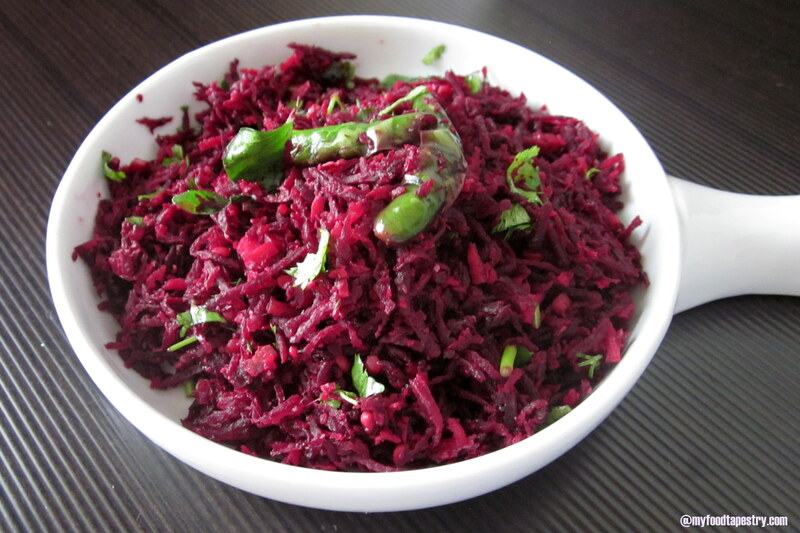 2 cups grated beetroot, depending on the size, you may need 2-3. In a wok, heat oil. 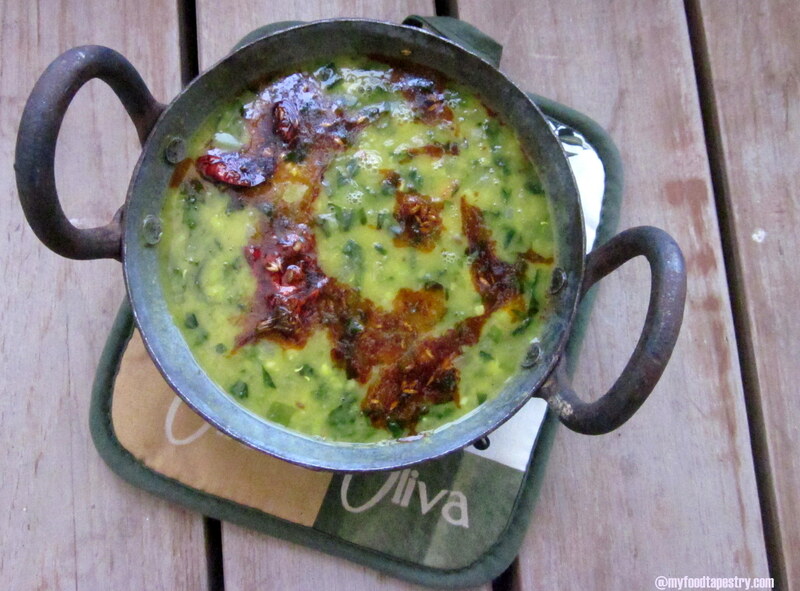 Saute the urad dal. Once reddish, splutter the cumin and mustard seeds. Throw in the garlic, ginger, green chili and curry leaves. Fry just for a minute or so. 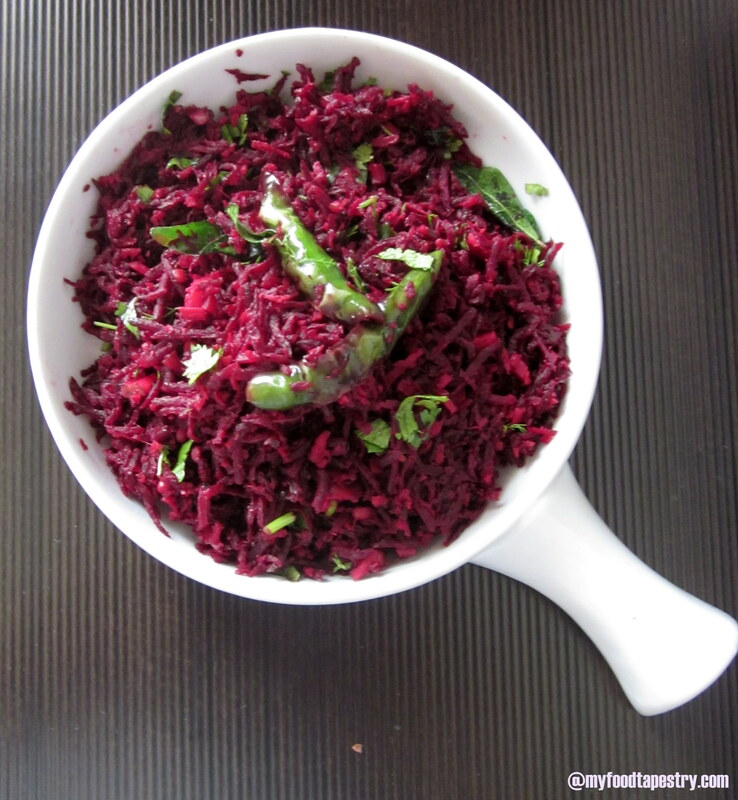 Quickly add the grated beetroot. Add salt. Now stir fry on medium flame for not more than 5 minutes. Switch the flame off. Mix in the coconut and lime juice. Garnish with coriander leaves. 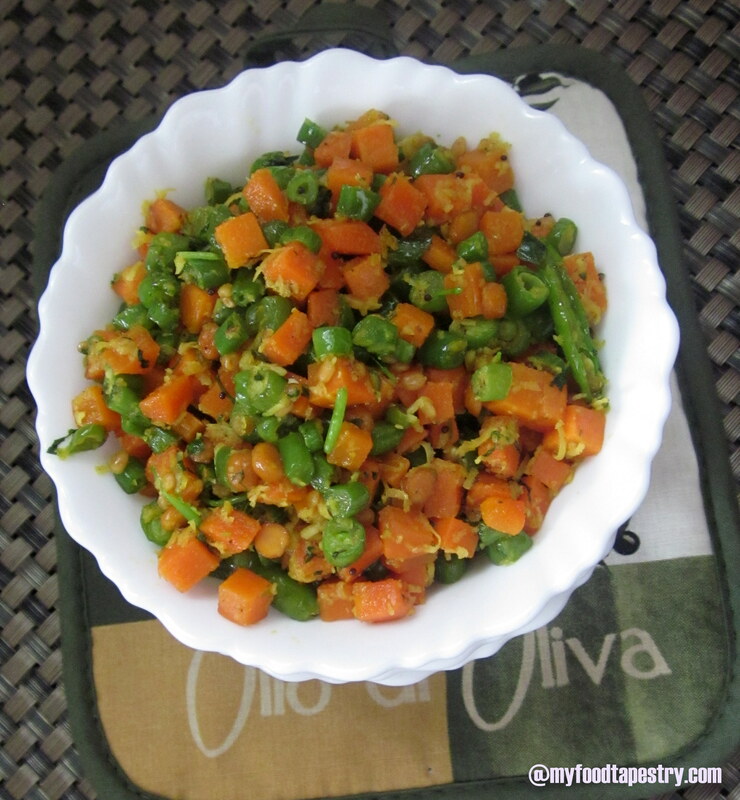 Enjoy it with rice or rotis or simply as a salad, your call. Not a fan of garlic? Skip it, and add asafetida/hing when tempering. My mom tells me not to mix garlic and asafetida ever. If you are using garlic, then skip the hing and vice versa. Don’t ask me why though. They all(mom’s grandmom’s) have amazing age old tips which work although most refuse to give any proper rhyme or reason. Losing weight sure is a monumental task. It makes me think of food all the time.. just so defying the idea of avoiding food… Ah! And they say when you are hungry, everything tastes good. So here I polished my bit in no time, so does it mean the saute was actually not that yumm as I believed it to be? Well, you try and let me know. 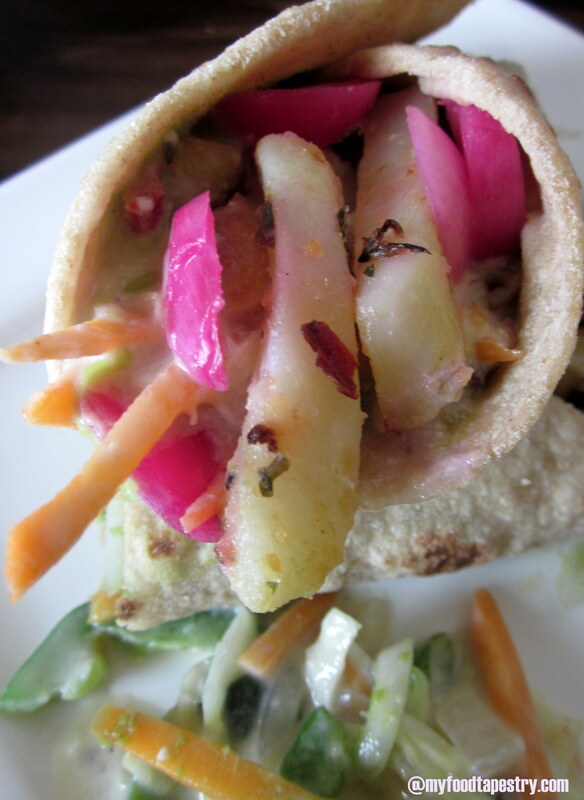 Chili Garlic Roasted Potatoes, Veggie Coleslaw and a Super Yummy Wrap! I’m having a writer’s block. Yet here I am posting this. Its been quite sometime since my fingers moved on the keyboard. And now as I sit staring at my computer screen, the mind goes blank. Words fail to combine. Interesting anecdotes refuse to flash in my morbid mind. Ah! so frustrating and de motivating. “Blank is good, its like a fresh canvas”, is my guy’s way of galvanizing my vacuous wit. I suppose it’s the mind numbing lunch that I made. Maybe all those flavors suddenly dimmed my senses.. Maybe the divine garlicky potatoes and creamy veggie coleslaw had something to do with my comatose state. What?! Did I just hear that? Did he just say that?! Well, that was enough to wake me up and put my languid senses back on track. Men say the darnest things at the darnest times. Just when I was half sleepily glorifying my culinary skills, attributing my lackadaisical writing attempts to the “supposedly” gorgeous lunch I made, he had to say that! In an arduous pursuit to prove him wrong, I fret, fume, wash my face and make myself a super strong coffee. It works. It all does. His mindless opinion, the cold water on my face and of course the coffee! Now to lay some facts straight: The lunch was gorgeous. Every bite was flavorful and whole. And maybe I ate half a wrap more than I should have. 😉 But then we all did. He too. Just that he didn’t drowse after that and I did. Well, coming to the recipe. This is an improvised last-minute attempt. You cannot really go wrong with potatoes, garlic, butter and coleslaw. Can you? I made some roasted baby potatoes the other day. From there my imagination spewed to the various ways of incorporating the yumminess in our daily diet. 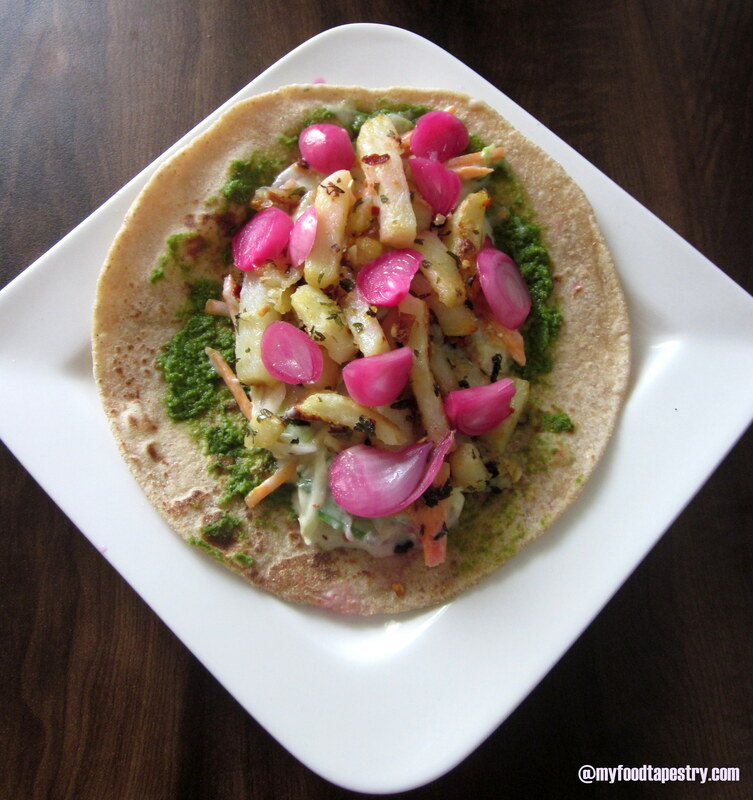 Thus, a no mayo simple easy crunchy creamy coleslaw, along with some vinegary onions, green mint coriander chutney and chili garlic roasted potatoes, all put together on a tortilla/chappathi was the lunch that I am raving and ranting about. 4-5 medium-sized potatoes, washed, peeled and cut into fingers. Get the oven pre heated and ready. Throw the potato fingers in scalding hot water for 5 minutes. Drain and remove on a clean kitchen towel. Pound the garlic and red chili flakes in a mortar and pestle. Mix with olive oil, parsley, salt and pepper. Coat the potatoes with this heavenly oil. Spread them on a baking tray and bake at 180 C for 15 minutes or till they turn golden and crisp. Alternatively, you could roast them on a huge flat frying pan, sauteing all the while till they turn golden and crisp. Heat butter, saute garlic, green chili(if using) and bell peppers, Once done, add the flour. Then in goes the milk. Stir all the while to make a creamy white sauce. Season with salt, red chili flakes and pepper. Switch the flame off. 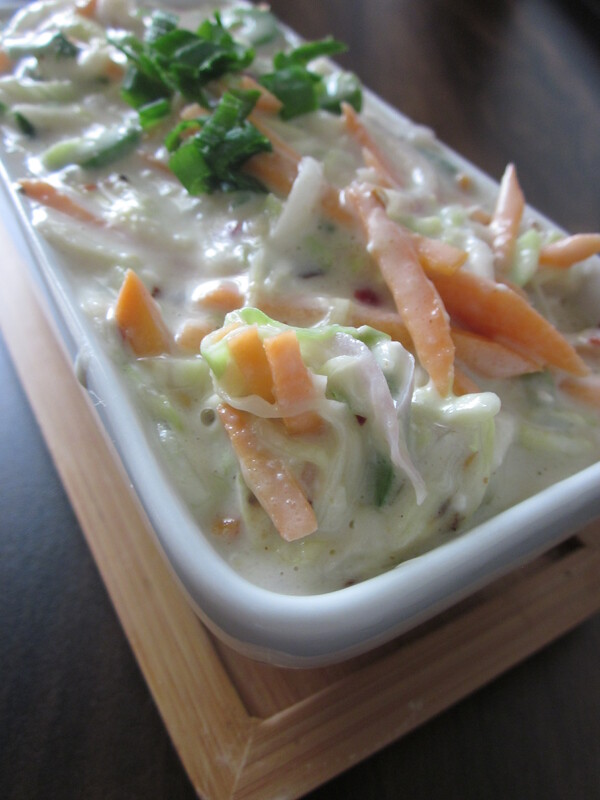 Now mix in the sliced veggies like cabbage, onions, carrots and scallions. Mix well. Check for seasoning. Keep aside. In a small bowl of vinegar, add a tsp of salt and some sliced onions. Keep aside. They turn pink after sometime because of vinegar and salt reaction. Take a tortilla/chappathi. 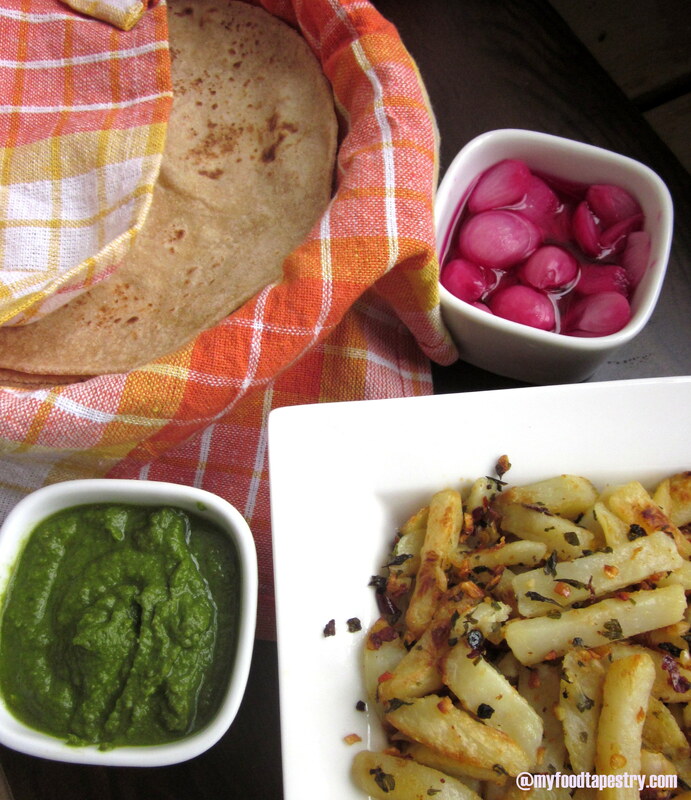 Spread a tbsp of green chutney or as much as you desire. 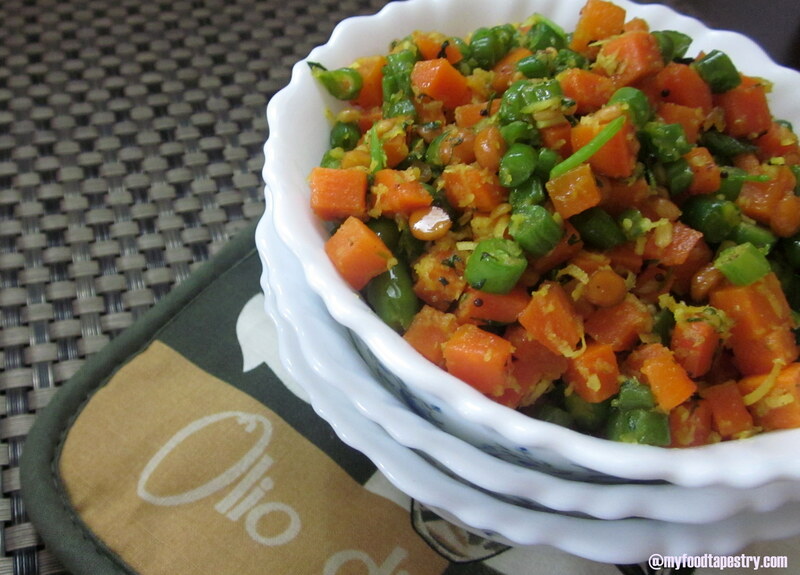 I added this Indian twist to it, cause we are a family of coriander chutney lovers. We like it on everything. You can omit it you like. Next spread a tbsp or two of coleslaw. 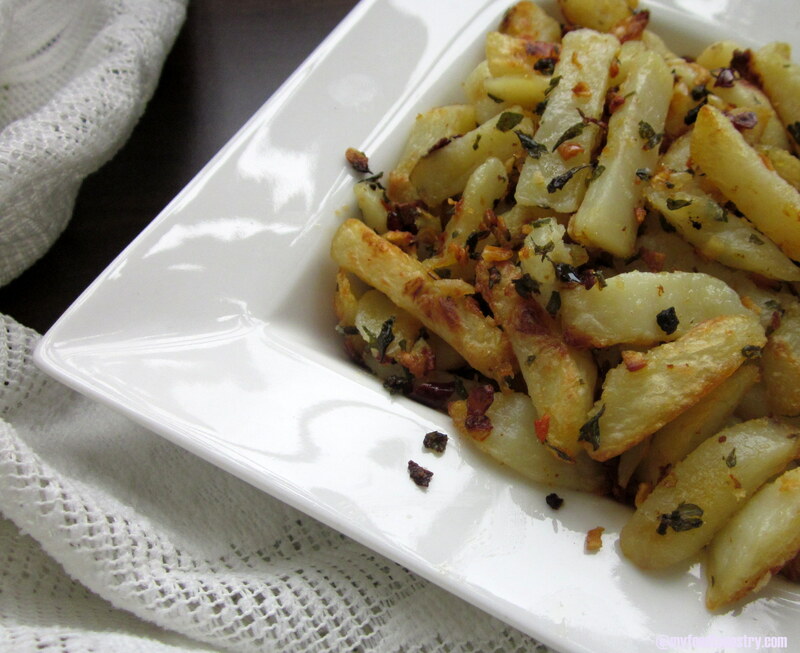 Top with garlic potatoes. Sprinkle some vinegar and finish off by placing the tart vinegary onions. Wrap and serve by some more coleslaw on the side. Best enjoyed with some chilled drink. 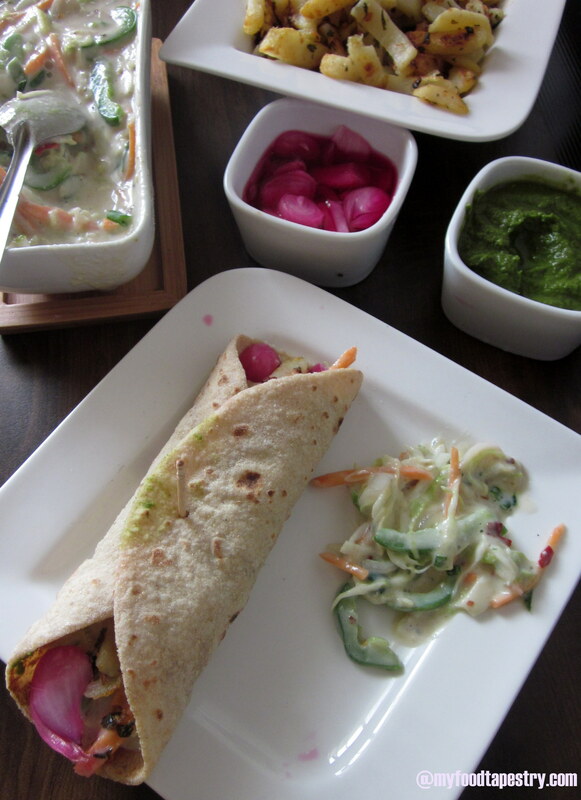 For those who want to avoid potatoes, maybe you could try this wrap with some roasted broccoli or cauliflower or paneer(cottage cheese/paneer wrap). My penchant for these quick fixes is quite well known. 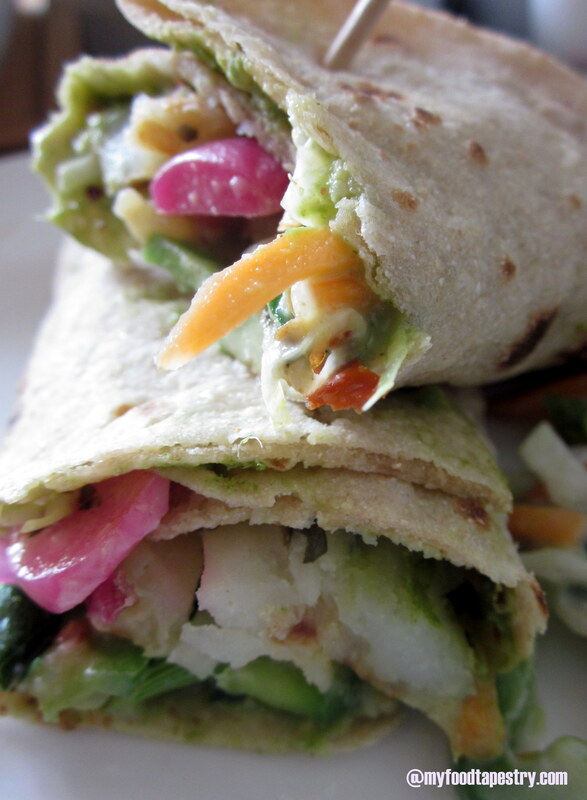 I love making wraps with whatever the pantry and refrigerator have to offer. 1. Sandwiches! They make awesome sandwiches. Add a layer of cheese and some spicy chutney for that extra kick and you have yourself a fancy looking bite! 2. Salads. 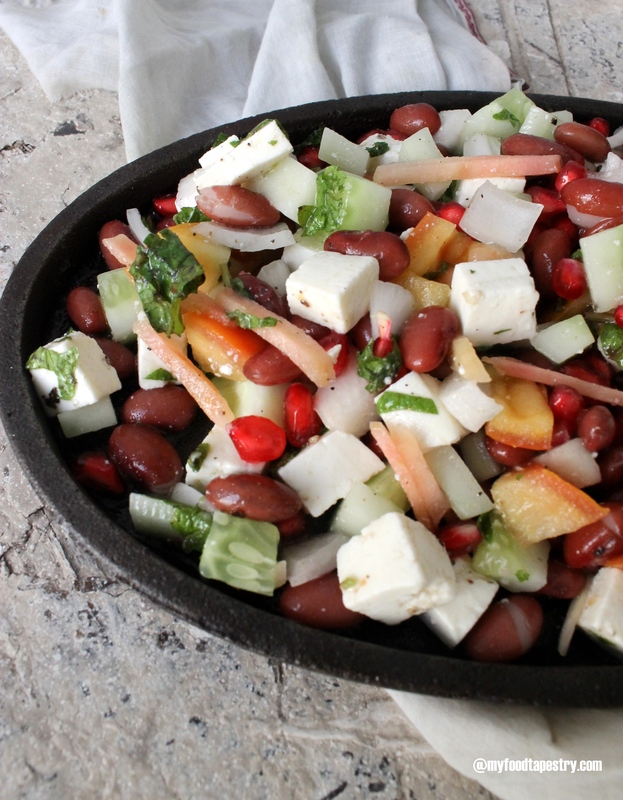 Add some tangy citrusy fruit like pomegranates, oranges and strawberries and a very interesting salad is born. 4. On potato/corn/mushroom or any type of pattice. And still no sign of peace, quiet, resignation, relaxation. In fact weekends are more challenging with never-ending social commitments, dining out and classes which cannot be taken during the week. In times like these, I dream. I dream of mountains, of chilly soft breeze, of a great book and of some irresistible coffee. What! Then why a SALAD recipe?! When you have spent more time in the car than on your comfy bed. When you have spent more time choosing gifts for brothers and nephews than lounging in front of your television. When you have attended back to back Rakhshabandhan pre lunches and dinners, rather than eating khichdi. I am so not a salad person. 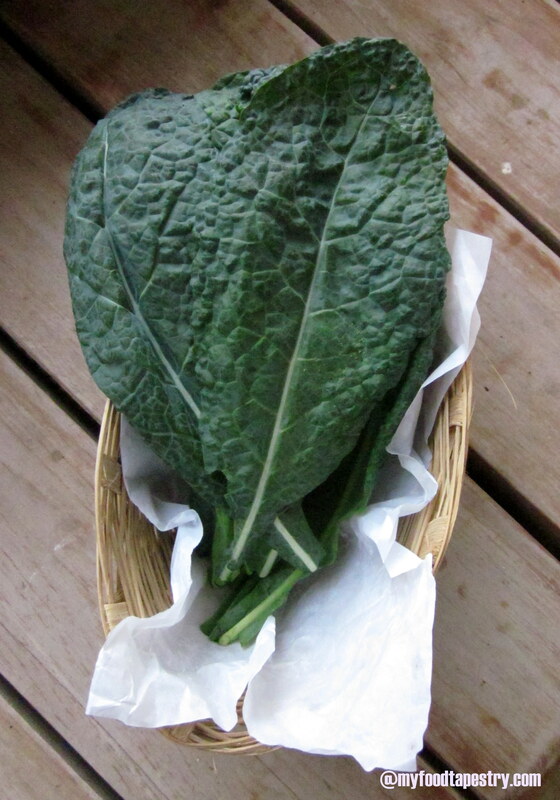 All that raw-chewy-leafy is too much for me to chomp on. 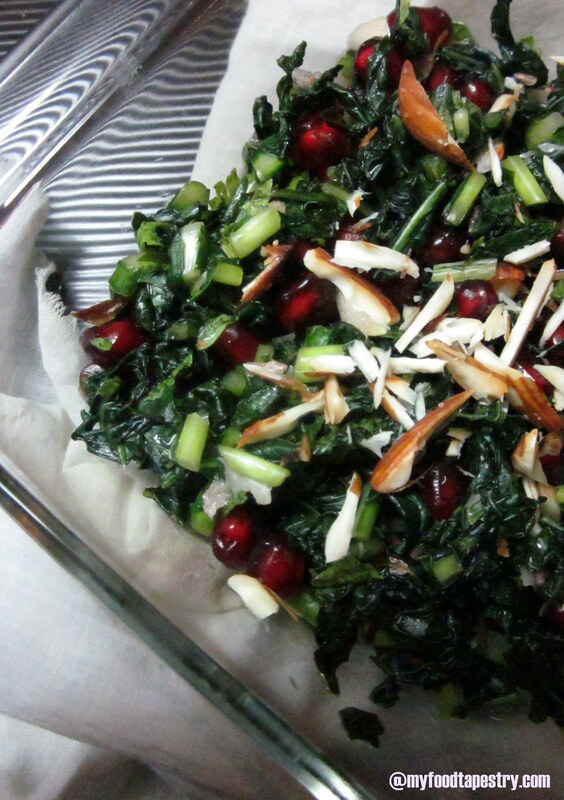 But weirdly, I felt like skipping dinner and munch on something light-cool and crunchy. Dear husband’s jaw dropped open when he saw me tossin the greens. Salad huh? Since when?! Since now. And he beamed, thinking his naturopathy has rubbed off on me. Poor chap doesn’t realize, my salad fad is so temporary. 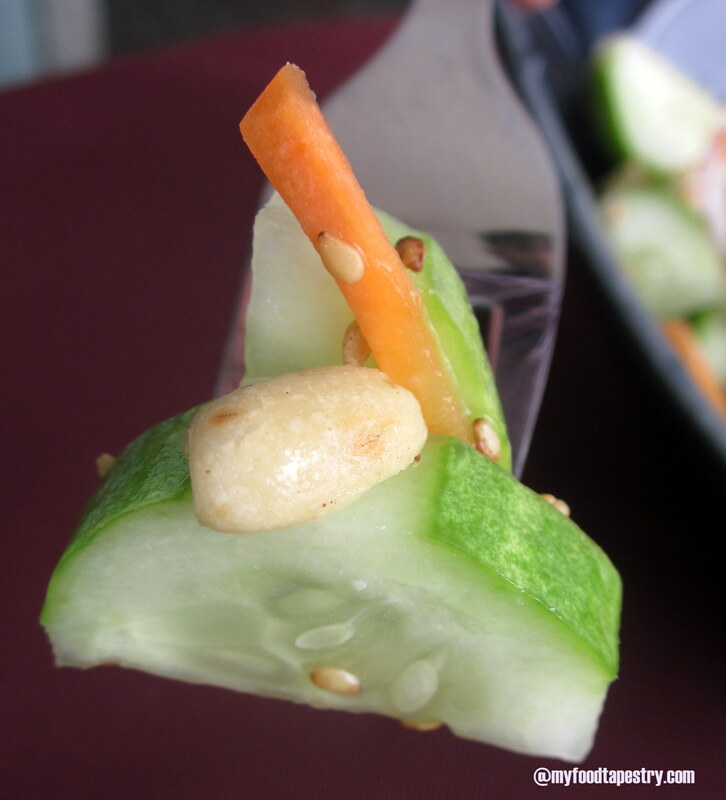 Picking my favorite raw veggie, cucumbers and decorating them with a bit of color(Read: carrots) and drowning the dish with a lemony sweet vinaigrette, topped with toasted sesame and peanuts is my very own mix mash of innumerable salad recipes that I have come across. 1/2 tsp red chili flakes – optional. In a bowl, add the vinegar, lime, sugar, salt and oil. Mix in the onion rings. Pour this vinaigrette on cold cut cucumbers and carrots. Mix well. Sprinkle sesame seeds, peanuts and red chili flakes. Toss. I ate it fresh. 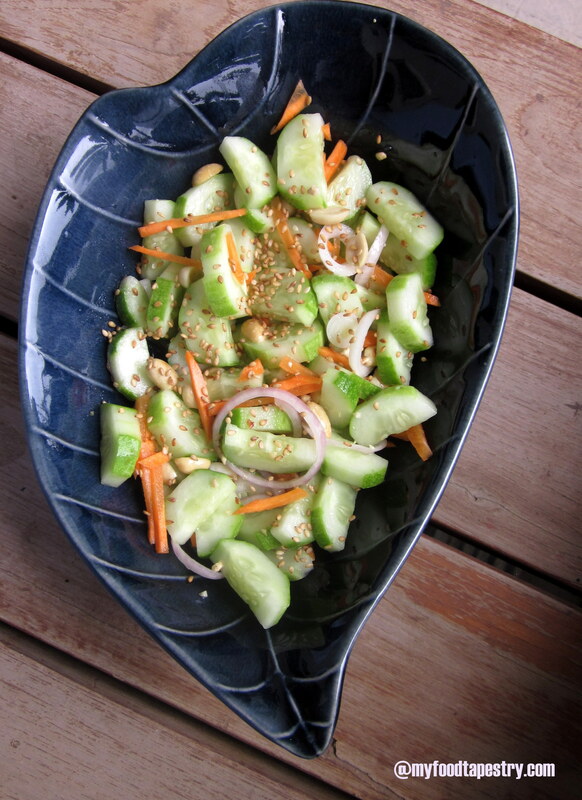 But you could refrigerate for 30 minutes so that the cucumbers soak up the dressing. Serving Suggestion: A calm quiet peaceful solitary setting. Enjoy every morsel. Stun with every flavor. I did not have this privilege. My 6-year-old was tearing my back down. Grimacing at the bites that I so lovingly offered. Husband was panegyrizing the benefits of salads, in some massive effort to turn me into a hermit. Soon, I shut the mad room out, bowl in one hand, my inseparable book in the other, and walk into the dreams that I so frequently dwell in. 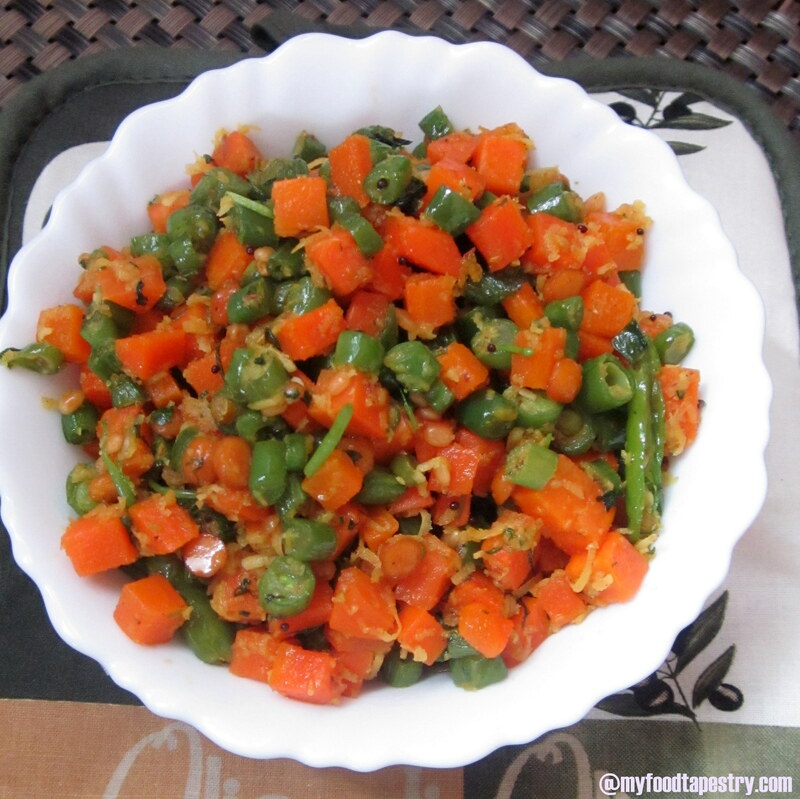 Simple vegetable stir fry seasoned with chana dal and mustard seeds flavored with coconut and coriander is PORIYAL in Tamil. 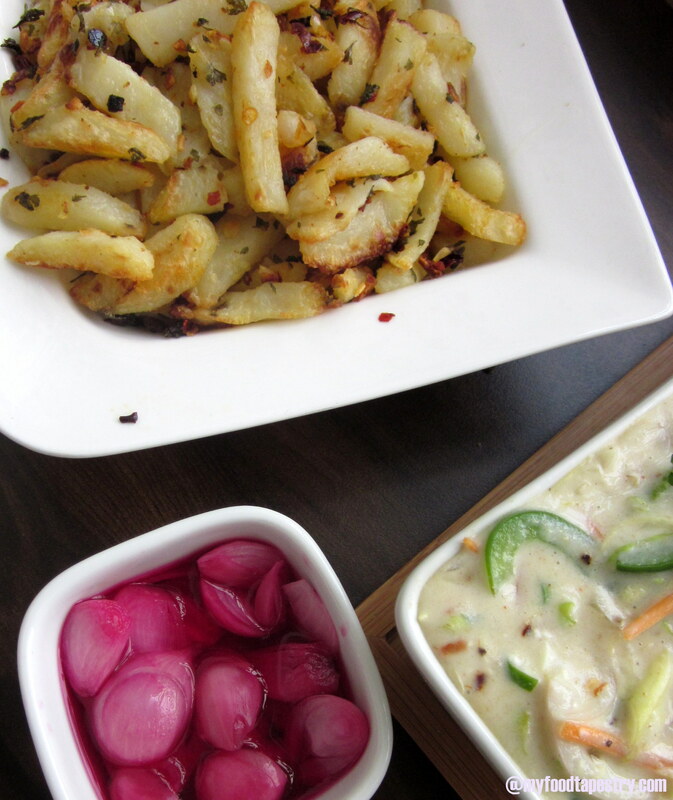 Poriyals can be made with any vegetable of your choice. It is inanely simple to prepare and delicious with hot soft white rice(SIN!!). Settled in Mumbai for the past 5 years has not diminished my love for South Indian food. Infact, since I am not in Bangalore anymore where ever increasing in number Darshinis(self service South Indian restaurants) serve awesome authentic Karnataka/Tamil food, I try to make as much of it at home. 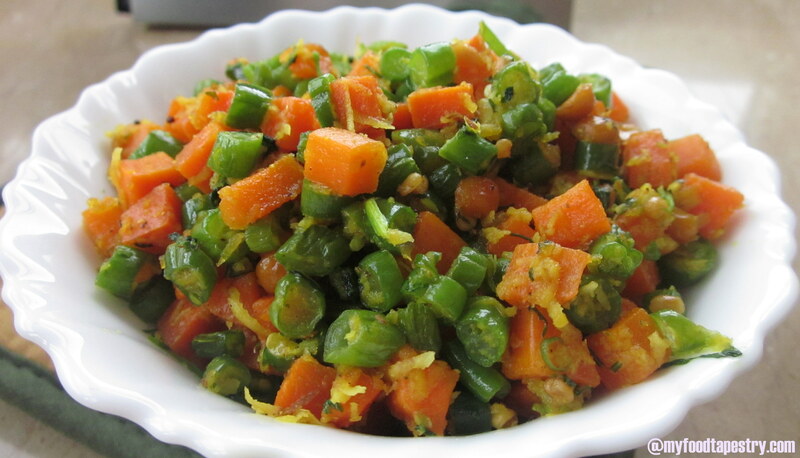 These simple poriyals have fresh diced veggies in minimal spices and oil with just a wee bit of tempering. SO, its almost a salad. Most of the time you will find yourself eating it all by itself sans the sinful rice. 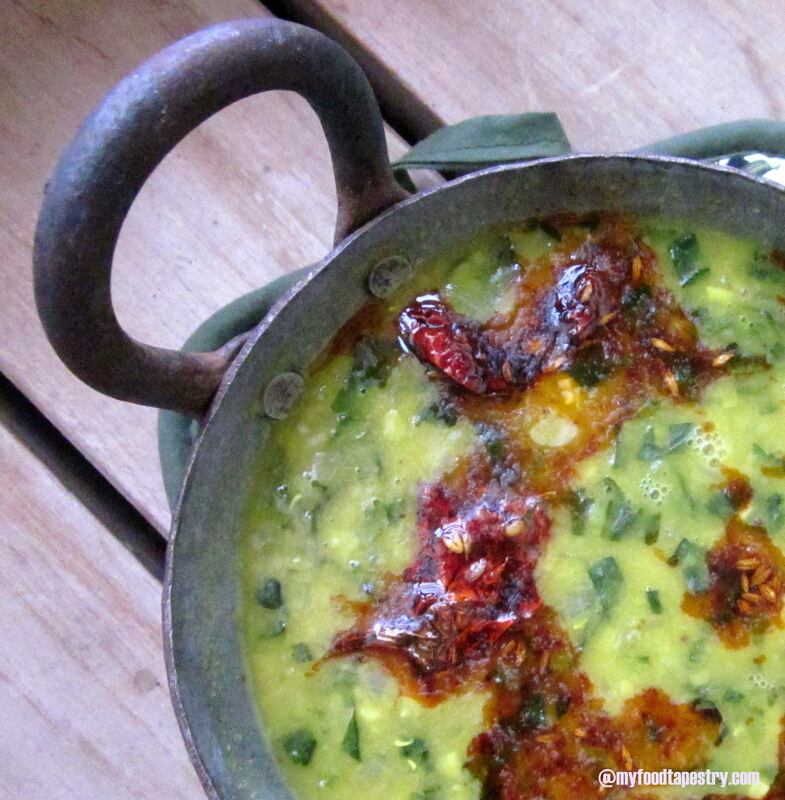 Along with a big bowl of lentil soup(Daal), it accomplishes to make a complete meal for those weight watchers. 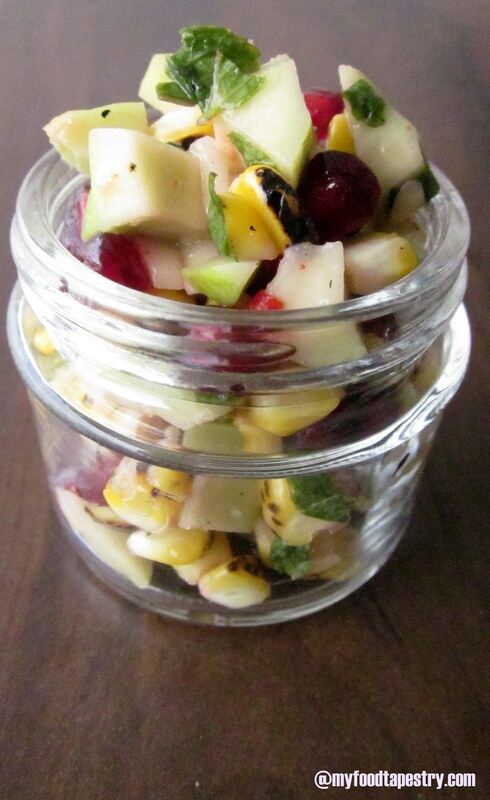 Great alternative to those chewy boring salads. In a pan, heat oil. Roast channa dal on medium heat till light brown. Splutter mustard seeds at this stage. Sprinkle asafetida. Next goes in the curry leaves, green chilies and ginger and the diced veggies. Sprinkle salt and turmeric powder. Cover and cook till almost done. I like some bite to the veggies, so I leave it at 3/4 th done. But I personally know many who like their vegetables fully cooked. So, your call. Once done, sprinkle coconut, lime juice and coriander. Mix well. Turn the flame off. 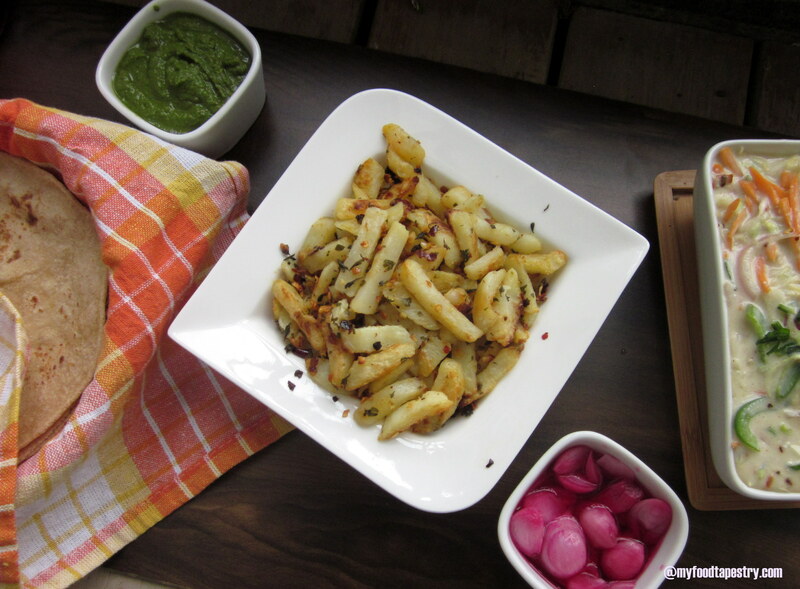 Serve with hot rice or chappathis or enjoy them on their own. This is one dish that need not be reheated. It tastes yumm even when cold( and I don’t mean, straight out from the fridge). Orange and Green… reminds me of our Indian Flag. If you want your veggies to reflect the natural bright color, don’t cover and cook. Let the veggies be done without the lid and stir frying in between so as not to burn the contents. Chances are your mom would scold you for doing this. The nutrients vanish in thin air .. literally, but when we lidd the contents, the goodness doesnt go away. So they say. But, what I do is: When Im having guests over, and if this is on the menu, I let the colors shine, as presentation and colors should appeal to my guests. But when I make it regularly at home, I retain the goodness. 3. 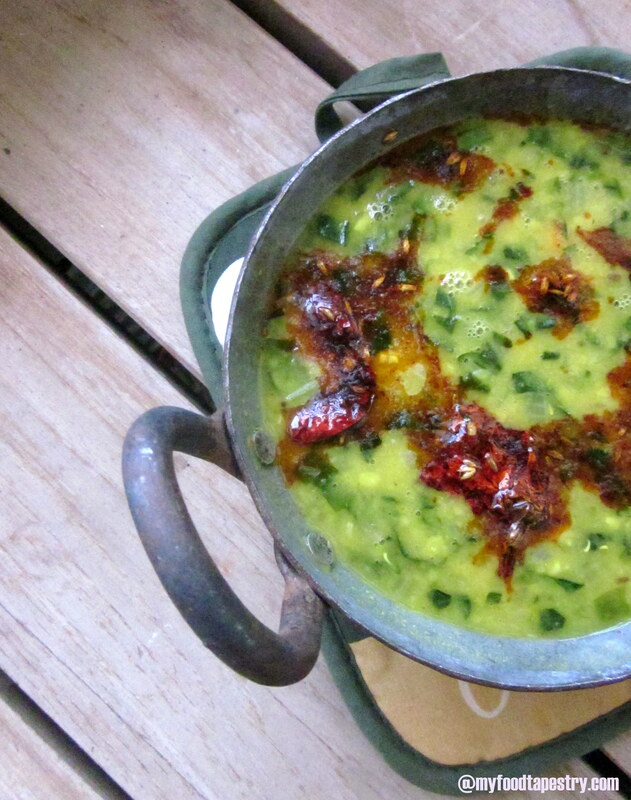 Boiled chickpeas can be used, and the dish is called “Sundal”, for this you skip the fried bengal gram. 4. 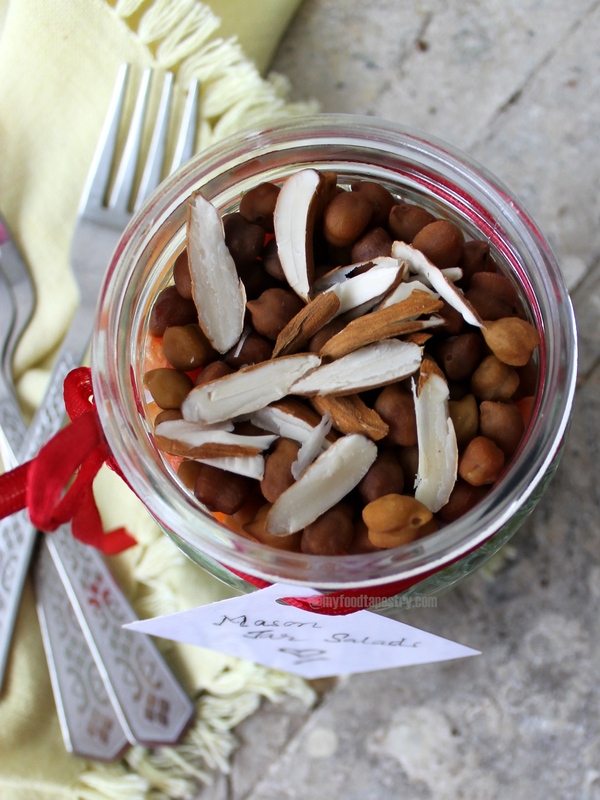 Boiled peanuts made into a poriyal make a very tasty and healthy snack. If you know of any more combinations, do drop me a line.